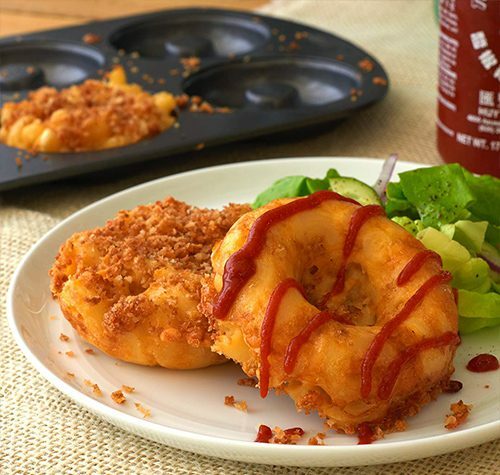 National Mac & Cheese Day Recipe: Creamy Cheddar Mac & Cheese Donuts! Holy Mother of Gouda, will you look at that photo? Did you ever imagine that such a thing as a Mac & Cheese Donut even existed? I did not, and yet, there it is. With today (July 14th) being National Mac & Cheese Day, I snagged this recipe for Creamy Cheddar Mac & Cheese Donuts from the website of Three Bridges [www.threebridges.com] — a chef-crafted pasta, sauce, and meal brand that makes clean eating easy. If donuts make you go nuts, this is the dish for you. Breaking the mold, these donuts trade in the sweet for the savory, but don’t be fooled — they’re just as addicting! Here’s how to make them! Prepare Three Bridges Creamy Cheddar Mac n Cheese per directions, let cool. Preheat oven to 350ºF. Mix the panko bread crumbs, one tablespoon of melted butter, and half of the cheddar cheese (1/2 cup). Set aside. 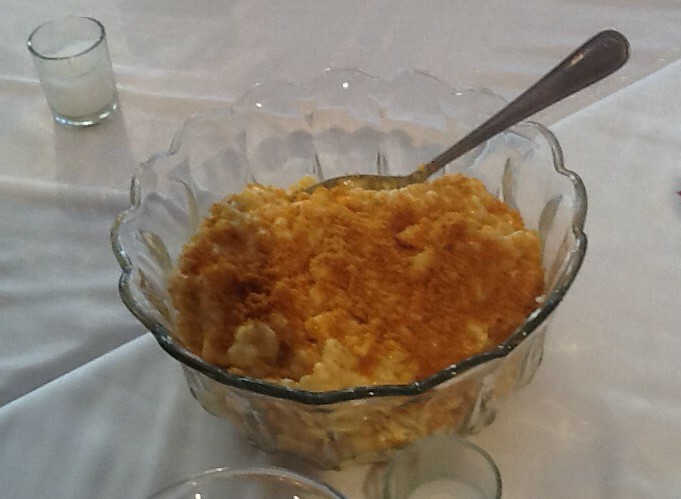 Mix the mac & cheese with the egg and flour and remaining shredded cheddar cheese (1/2 cup). Use remaining butter to grease donut pan. Spoon the mixture equally into greased donut pan and sprinkle with the panko breadcrumb and cheese mixture. Bake for 15-20 minutes or until golden brown and donuts feel firm. Add your favorite toppings to the donuts. Serve & enjoy! 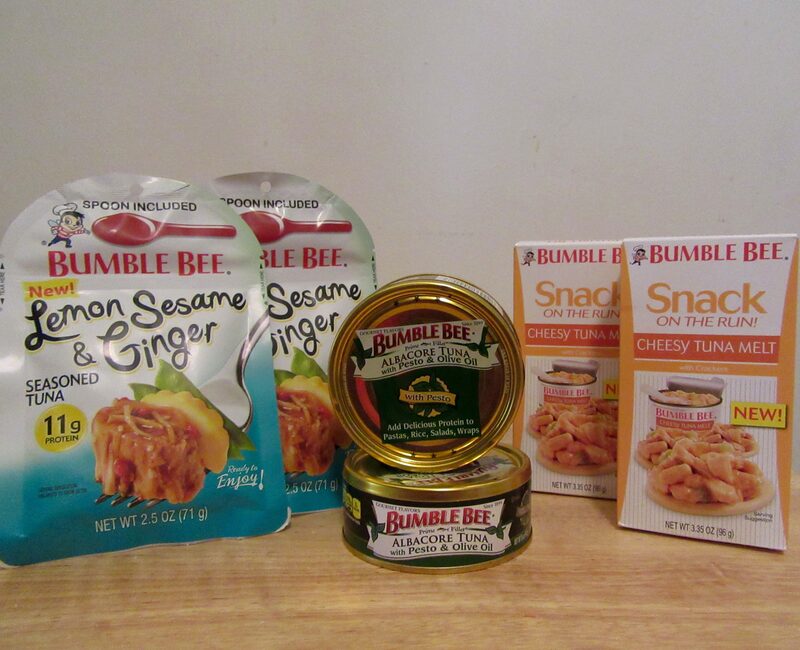 Delicious New Products from Bumble Bee Tuna! Warmer weather is finally here, and it’s time to start planning lighter meals as we move towards summer, which will arrive any minute! Tuna is surely a favorite food that many have been eating since childhood, but there are lots of new ways to enjoy tuna besides the familiar tuna salad sandwich. Bumble Bee has just introduced several new products to its line of top quality albacore tuna, which are ideal for easy snacks and light lunches, and as key ingredients in hot or cold summer entrees. Let’s take a look at what’s new on the supermarket shelf! 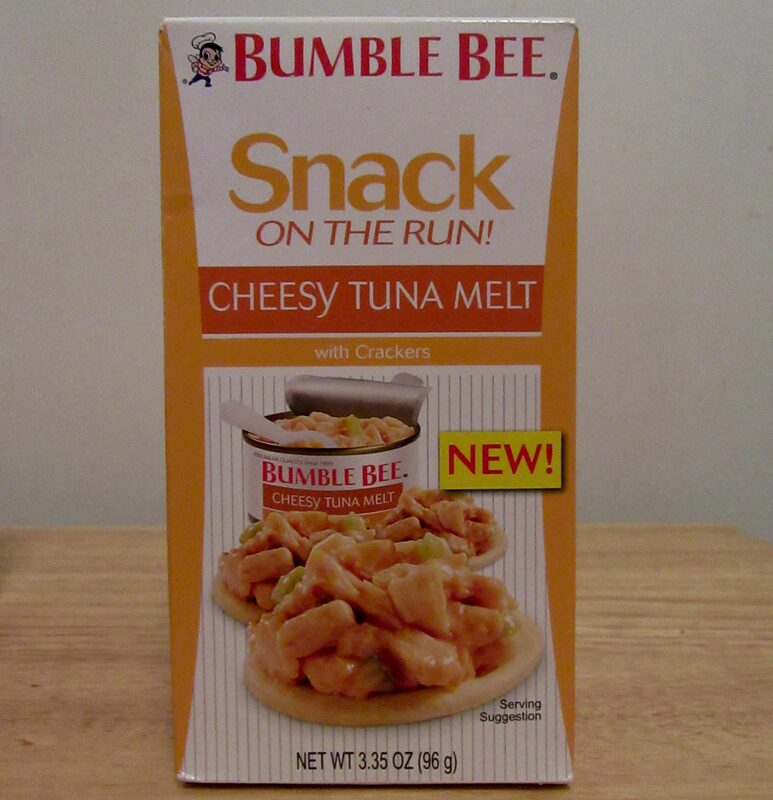 Bumble Bee’s Snack on The Run line of ready-to- eat snack kits introduces a new flavor, Cheesy Tuna Melt, which will appeal to both kids and adults. 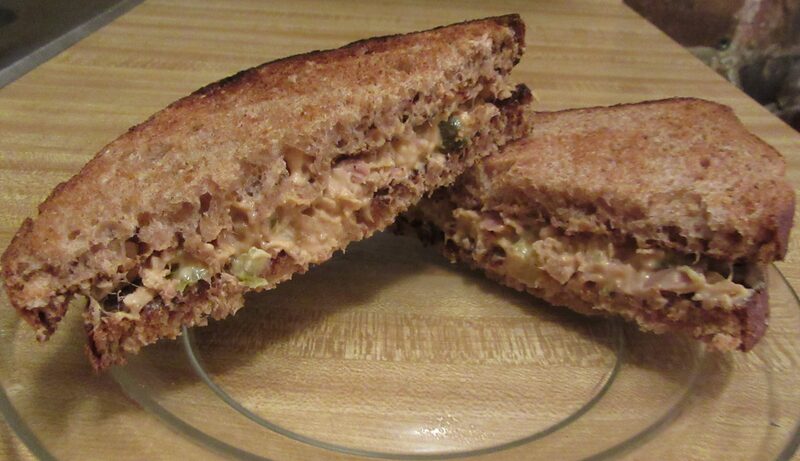 Cheesy Tuna Melt Snack includes a 3.35 ounce can of cheesy tuna salad with pickle relish that kids can safely and easily open. 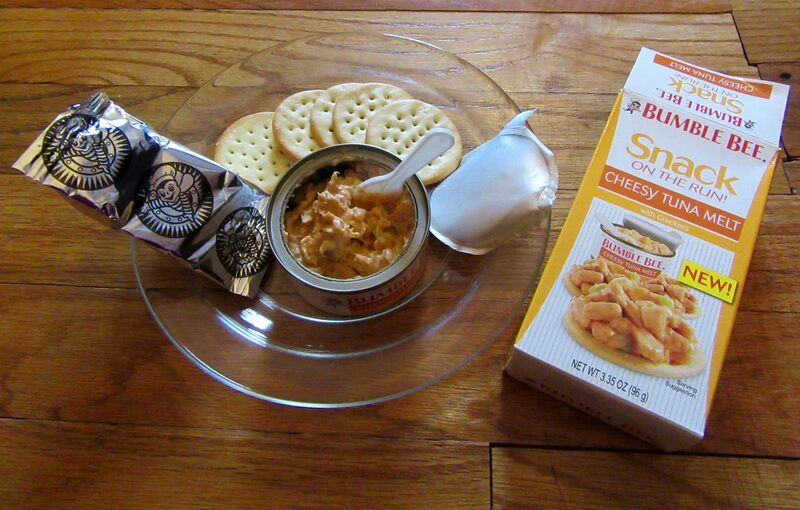 The kit includes a small spoon for scoopig the tuna onto 6 buttery round crackers for a no mess, tasty snack or school lunch. Everything you need is in the kit, for minimal fuss. It is literally a grab-and-go snack! Behold: My very tasty Cheesy Tuna Melt on Crackers light lunch that I enjoyed while working at my computer. There was still more tuna in the can when I took this photo! You could also enjoy this Cheesy Tuna Melt sandwich on toast! 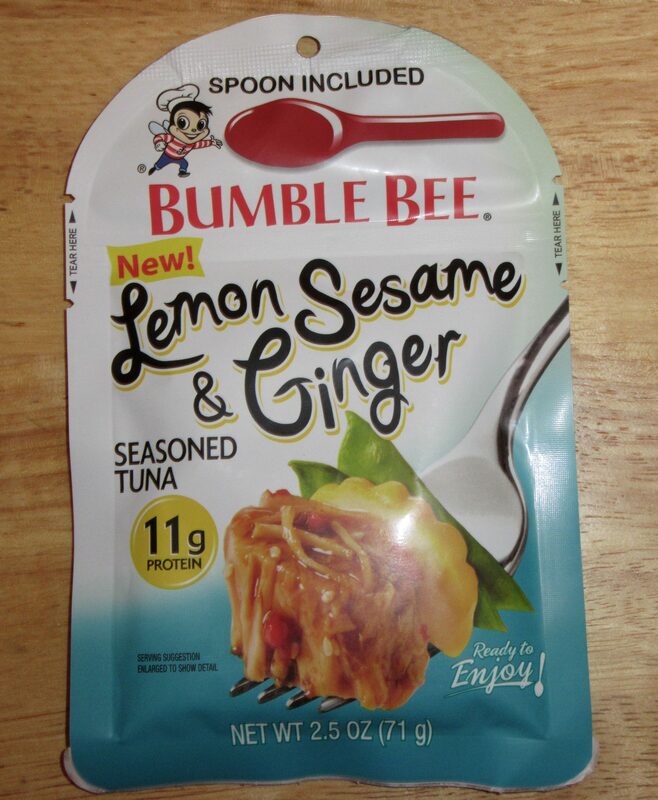 Bumble Bee also has line of seasoned tuna varieties that come conveniently sealed in a pouch, with a spoon included! You can enjoy this flavorful Tuna — the one I tried was seasoned with fresh Lemon, Ginger and Sesame — right from the pouch, or use it as the main ingredient in a healthy Mediterranean or Asian themed sandwich, wrap or salad. 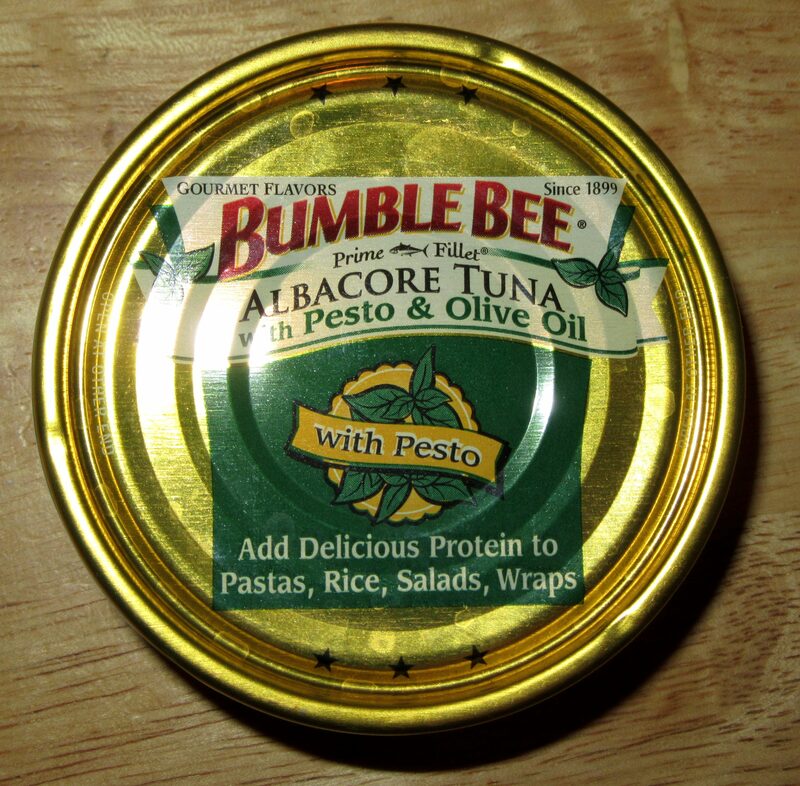 If you wish that making a fresh and delicious dinner from scratch was as easy as opening a can, may I introduce you to Bumble Bee’s new Prime Filet Albacore Tuna with Pesto and Olive Oil! Mangia! 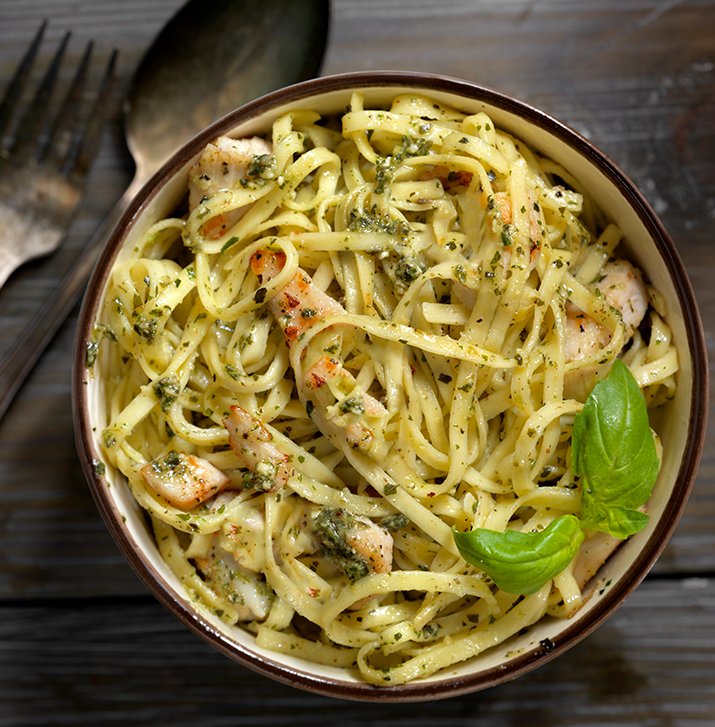 This decadent looking Pesto Tuna Angel Hair Pasta (Recipe Here) is fifteen minutes from prep to plate! Find out more about the Bumble Bee family of fine seafood products, and get easy and innovative recipes that feature Bumble Bee Tuna at This Link! 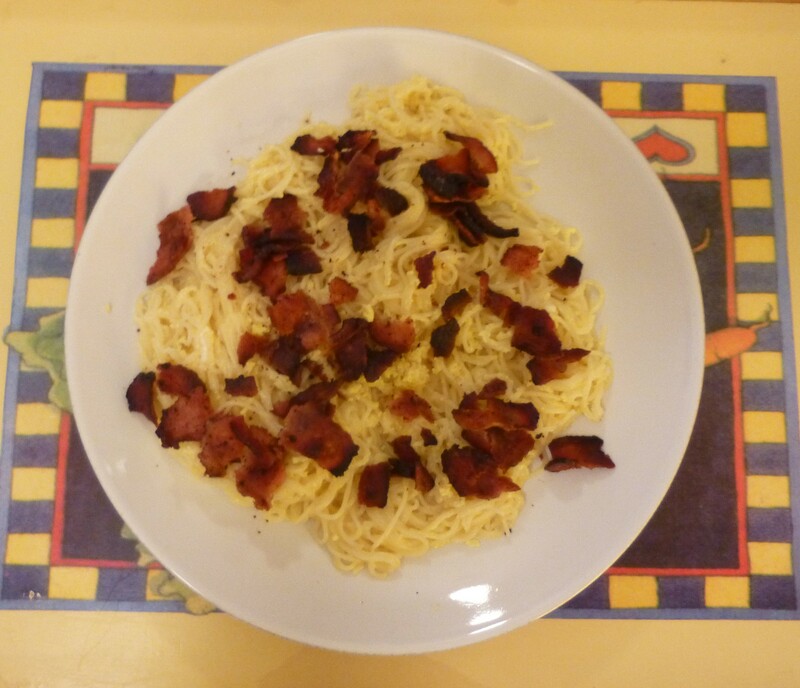 Easy Pasta Carbonara Featuring Jones Dairy Farm Cherrywood Smoked Bacon! Hello and welcome back to another enlightening episode of Cooking With Gail, a post where I make a delicious dinner from stuff I already have in my house. Today we are making a super easy Pasta Carbonara featuring Jones Dairy Farm Cherrywood Smoked Bacon. 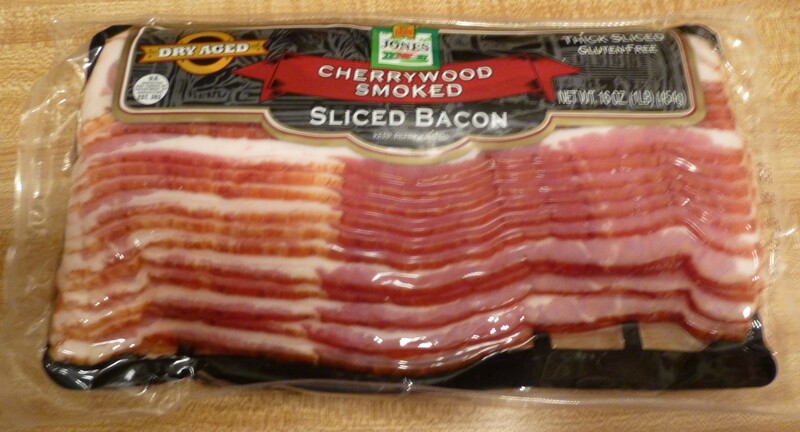 Bacon is something I like to keep on hand when possible, and recently I was sent an assortment off tasty meats from Jones Dairy Farm, including several types of Sausage, Ham Steaks, Canadian Bacon and, of course, the Cherrywood Smoked Bacon pictured above. What I am trying to do is use these meats in ways that differ from the standard manner of just cooking them up for breakfast with a side of eggs. While Pasta Carbonara does include both Bacon and Eggs, you will be surprised at how fancy these ingredients can taste. Fancy! While the pasta cooks in boiling salted water, cut the bacon in half, if desired, and fry it up until crispy. Beat the egg well and set aside. 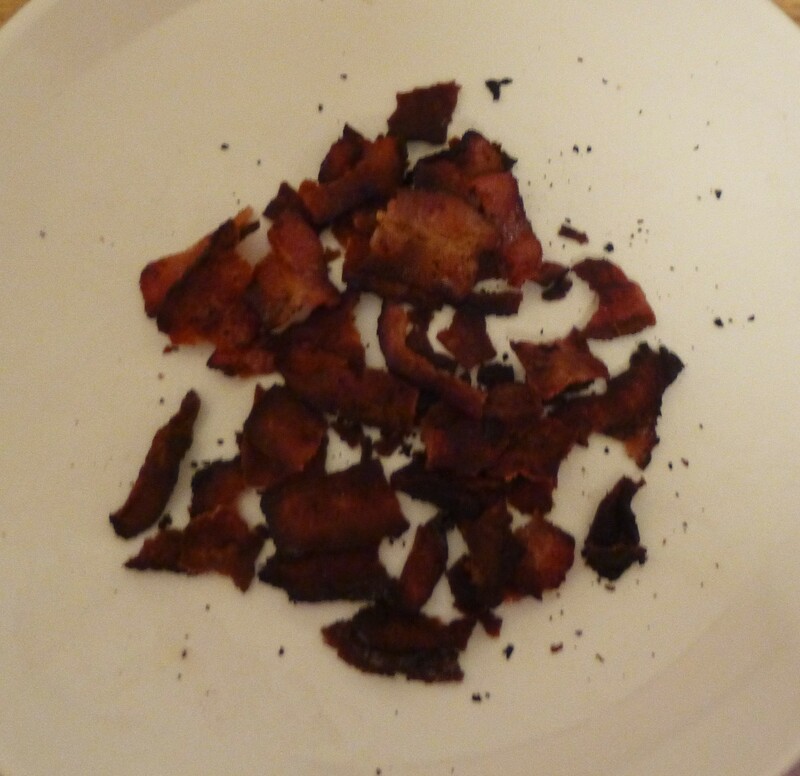 Lay the cooked bacon on paper towels and then, when cool, break it up into smaller pieces. You may be thinking that Bacon is Bacon, and that all Bacon is created equally delicious. I am here to tell you that this is not necessarily the case. Jones Diary Farm Cherrywood Smoked Bacon cooks up quickly and gets very crisp, because it has an excellent balance of fat to meat on each strip. I do not know if that is owed to their superior butchering technique, or if they have magic pigs, or what. 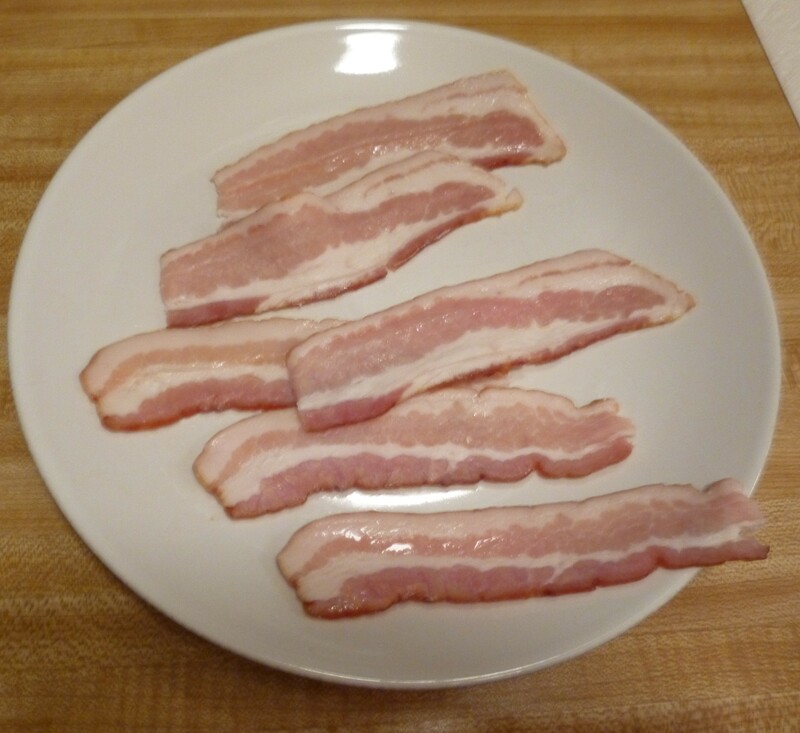 I just know that when I say I like my bacon cooked until it is “stiff, like little boards,” this is what I am talking about. Another stand out quality of Jones Dairy Farm Cherrywood Smoked Bacon is the slightly sweet taste that is infused in the meat from the mild Cherrywood smoke. The flavor is distinct and noticeable immediately on your fist bite. I really love it. But let’s get back to the Carbonara Prep! 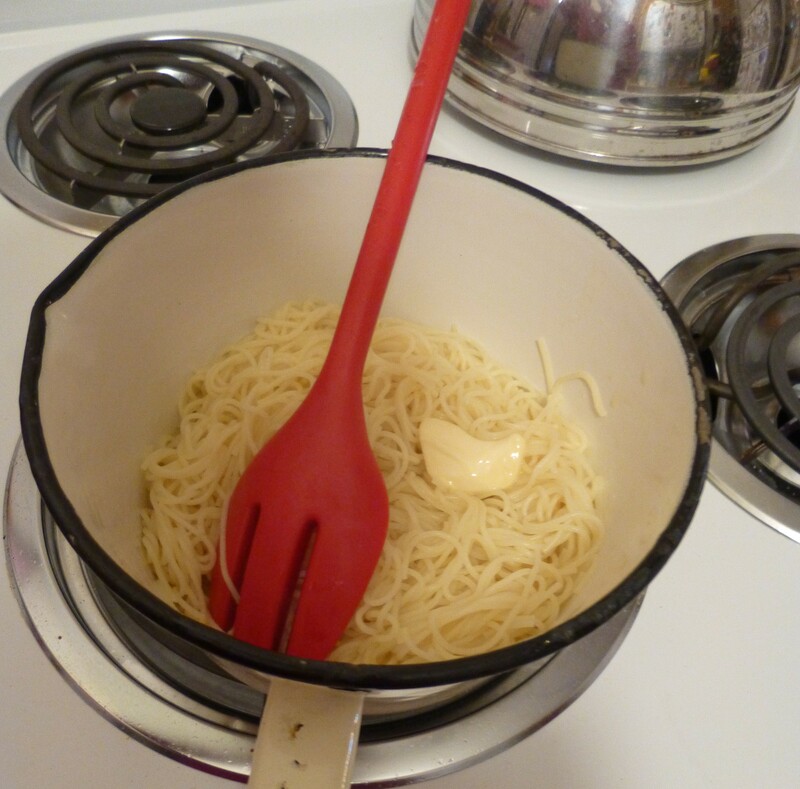 Return the cooked, drained pasta to the pan and add butter or margarine to taste, to add flavor and keep the noodles from sticking together. Next, add the beaten egg a little at a time, stirring well between each addition to blend and let the hot pasta cook the egg into a smooth, sauce-like consistency. In this case, it’s all in the wrist. At this point, you can add some grated Parmesan cheese, if you like. 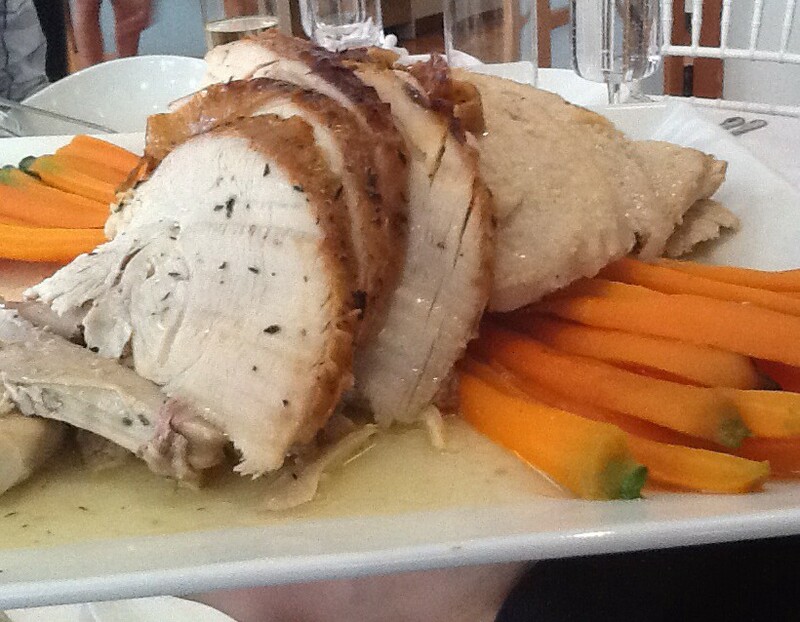 You are almost done, and ready to eat a delicious, home cooked meal! Plate the Pasta and add crumbled Bacon on top! So easy, so quick and so darn good! Make sure you have a glass of your favorite red wind on hand to accompany this fine dinner! Get more information about Jones Dairy Farm meats, get recipes and find out where to purchase them in your neighborhood, at This Link! 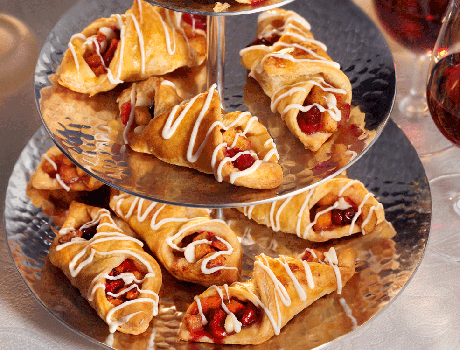 More Thanksgiving Recipes Featuring Pepperidge Farm Puff Pastry! Sausage, Cranberries & Stuffing Pastry, Recipe Below! A traditional Thanksgiving meal often means a chance to enjoy all of your favorite holiday dishes, but it can also be about changing it up and discovering new and innovative recipes to please yourself and your family! 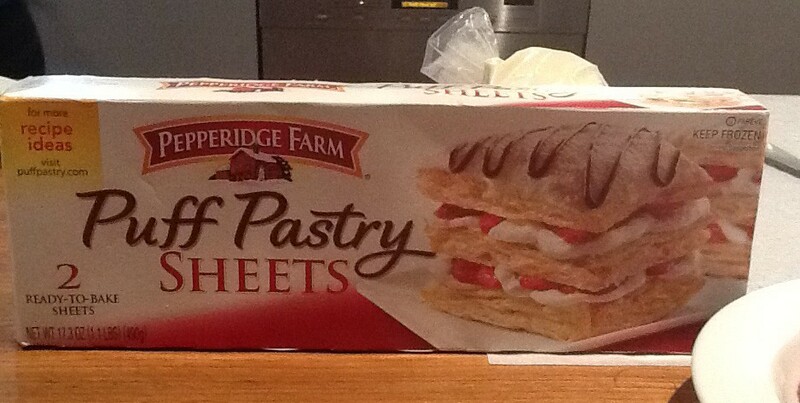 A good place to start for easy and delicious recipes is Pepperidge Farm Puff Pastry. Check these out! 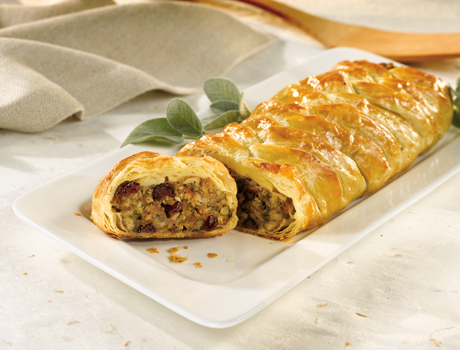 For Sausage, Cranberries & Stuffing Pastry, Pepperidge Farm Puff Pastry is woven around a comforting mixture of Pepperidge Farm Herb Seasoned Stuffing, sausage, green onions, mushrooms and dried cranberries, and baked until golden to make a festive and delicious dish. It’s also a great idea for using up any leftovers! I always have so many left overs, ever since I got one of the best vacuum sealers for my birthday, I’ve been saving food like a pro! Heat the oven to 375°F. 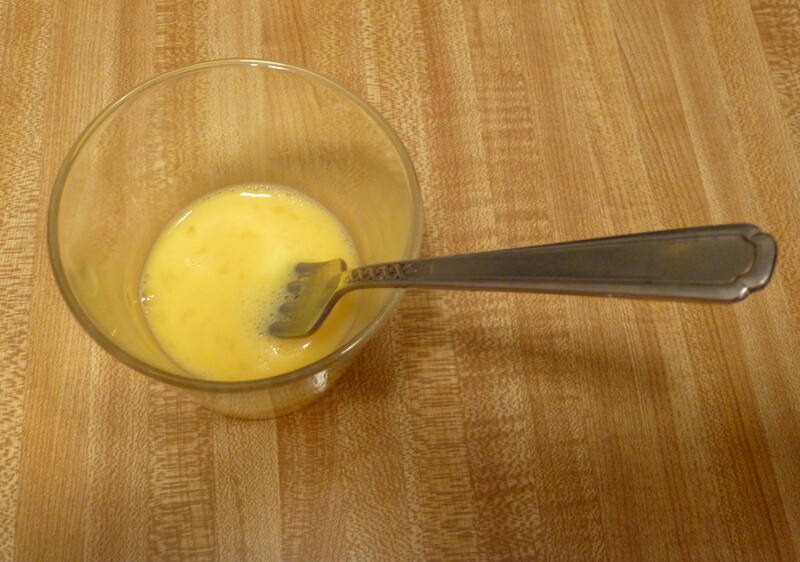 Beat the water and 1 egg in a small bowl with a fork or whisk. Lightly stir the sausage, stuffing, green onions, mushrooms, cranberries, sage and the remaining egg in a medium bowl. Unfold the pastry sheet on a lightly floured surface. With a short side facing you, cut slits 1-inch apart down both sides of the pastry sheet, from the outer edges to the fold marks. Spoon the sausage mixture down the center of the pastry sheet. Starting at the short side closest to you, fold the pastry strips over the sausage mixture, alternating sides, to cover the sausage mixture. Place the pastry onto a baking sheet. Brush the pastry with the egg mixture. Bake for 30 minutes or until the pastry is golden brown. Slice the pastry and serve warm with the gravy, if desired. Find out more about this and other recipes at This Link! Creamy Turkey Pot Pies are a fantastic idea for using leftover Turkey. Convenient products like puff pastry shells, frozen vegetables and cream of mushroom soup allow you to whip-up mouthwatering, individual pot pies in less than an hour. They make a great weeknight dinner. Heat the oil in a 10-inch skillet over medium heat. Add the onion and cook until tender, stirring occasionally. Stir the soup, milk and peas and carrots in the skillet and heat to a boil. Reduce the heat to low. Cover and cook for 5 minutes or until the vegetables are tender. Stir in the turkey and cook until the mixture is hot and bubbling. Spoon the turkey mixture into the pastry shells. Add the pastry “tops,” if desired. Get more information about this recipe at This Link! Harvest Spiced Envelopes – Recipe Below! Hey what’s up. Thanksgiving is less than a week away and you’ve got some cooking to do, I know. 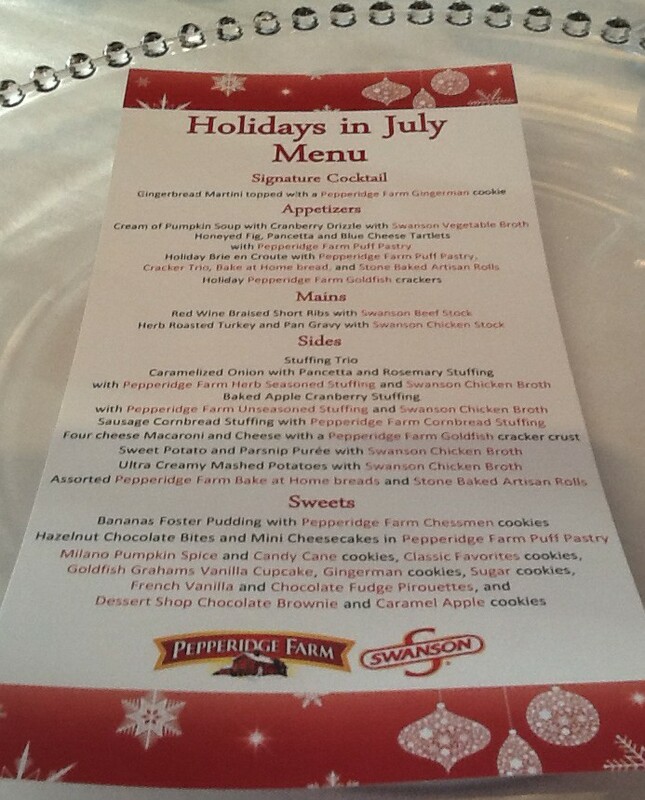 You might recall that this past July we ran a sumptuous holiday feast preview, courtesy of our friends at Pepperidge Farm, which you can revisit now to get some awesome recipes as well as ideas on menu planning and decorating. You’re welcome! One of my favorite Pepperidge Farm products is their puff pastry, which is super versatile, easy to work with and can be used for both savory and sweet creations. Let me share a couple new Dessert recipes that you might like to try out for this holiday season. Harvest Spiced Envelopes are a tempting dessert features white chocolate, apples, cranberries, cinnamon and walnuts enveloped in puff pastry and baked to a golden brown. The combination of flavors is outrageously delcious! 1.Heat the oven to 400°F. Line 2 baking sheets with parchment paper. Finely grate 2 teaspoons zest from the orange. 2.Heat the butter in a 12-inch skillet over medium-high heat. Add the apples and cranberries and cook for 6 minutes or until the apples are tender-crisp, stirring occasionally. Season with the salt. Stir in the sugar and cinnamon and cook for 1 minute. Remove the skillet from the heat. Stir in the walnuts and orange zest. Let the mixture cool for 30 minutes. 3.Sprinkle the flour on the work surface. Unfold 1 pastry sheet on the work surface. Roll the pastry sheet into a 12-inch square. Cut the pastry into 12 (4×3-inch) rectangles. Repeat with the remaining pastry sheet. 4.Place about 1 1/2 teaspoons white chocolate chips in the center of each pastry rectangle. Top each with about 1 tablespoon apple mixture. Brush two opposite corners of each pastry with water. Pull one corner up over the filling. Pull the opposite corner up over the filling and tuck it under the pastry, enclosing most of the filling but leaving the ends open. Place the filled pastries on the baking sheets. 5.Bake for 15 minutes or until the pastries are golden brown. Let the pastries cool on the baking sheets on wire racks for 10 minutes. 6.Heat the remaining white chocolate chips in a double boiler until melted and smooth, stirring occasionally. Drizzle the white chocolate over the pastries. 7.Recipe Note: Parchment paper keeps the pastry from sticking to the baking sheet and also makes for easier cleanup. If you don’t have parchment paper, you can spray the baking sheet with cooking spray instead. However, cooking spray may cause the bottoms of the pastries to brown more quickly, so begin checking for doneness 5 minutes early. 8.Flavor Variation: To serve these pastries as a gourmet appetizer, omit the white chocolate and substitute 1 large sweet potato, peeled and diced, for the apples. More information on this and other recipes is available at This Link! 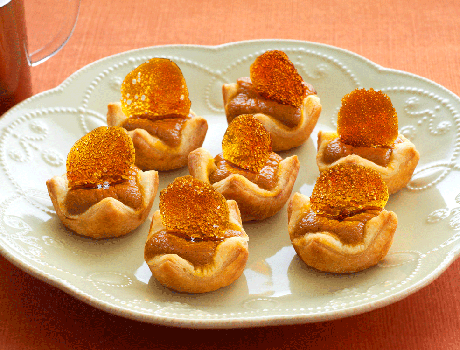 You will absolutely wow your guests when you serve these Mini Pumpkin Pie Brulees for dessert! Puff pastry cups are filled with a rich pumpkin mixture and baked until golden. Dressed up with a caramelized sugar round, they’re guaranteed to earn rave reviews. 1.Heat the oven to 400°F. Spray 36 (1 1/2-inch) mini muffin-pan cups with vegetable cooking spray. Beat the egg yolks, pumpkin, heavy cream, brown sugar, pumpkin pie spice and salt in a medium bowl with a fork or whisk. 2.Sprinkle the flour on the work surface. Unfold the pastry sheet on the work surface. Roll the pastry sheet into a 12-inch square. Cut the pastry into 36 (2-inch) squares. Press the pastry squares into 36 (1 1/2-inch) mini muffin-pan cups. Spoon about 1 tablespoon pumpkin mixture into each pastry cup. 3.Bake for 15 minutes or until the pastries are golden brown and the filling is set. Let the pastries cool in the pans on wire racks for 5 minutes. Remove the pastries and let cool completely on the wire racks. 4.Place the oven rack in the upper third of the oven. Heat the oven to 450°F. Line 2 baking sheets with parchment paper. Create 18 (2-inch) circles of sugar on each baking sheet, using about 1/4 teaspoon sugar for each circle. 5.Bake one baking sheet for 5 minutes or until the sugar circles are bubbly and a deep caramel color. Let the sugar circles cool completely on the baking sheet on a wire rack. Repeat with the remaining baking sheet. Using a small metal spatula, remove the sugar circles from the baking sheets. Press 1 sugar circle at an angle into the top of each pastry. More information on this and other recipes is available atThis Link! Bon Apetit, Everyone! 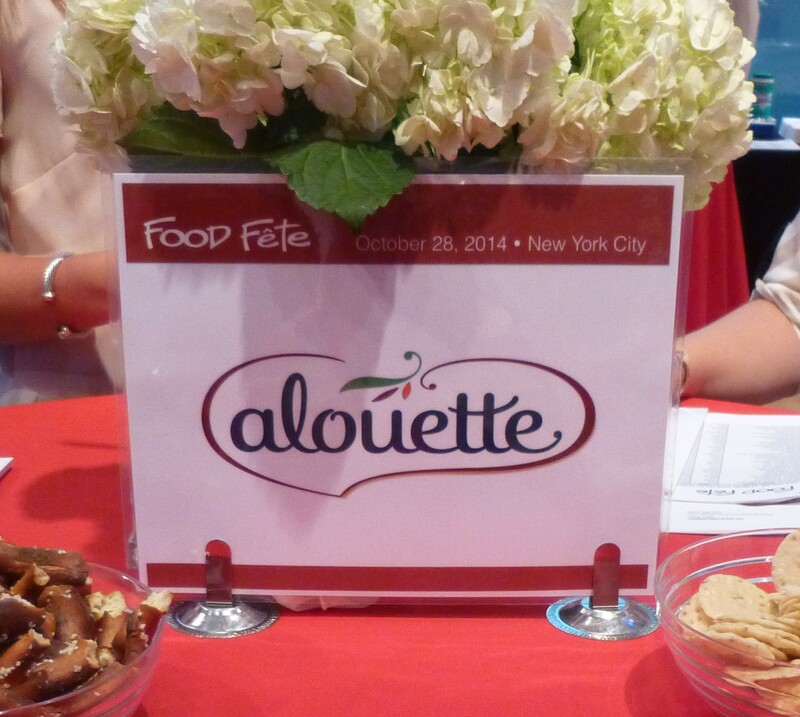 Food Fête Fall 2014: The Awesome Recap! Food Fête‘s fall showcase officially kicks off the Eating Season: with lots of holiday cooking and entertaining to look forward to, as well as gift giving and a general period of guilt-free pampering and self-indulgence during the colder months. Let’s eat! 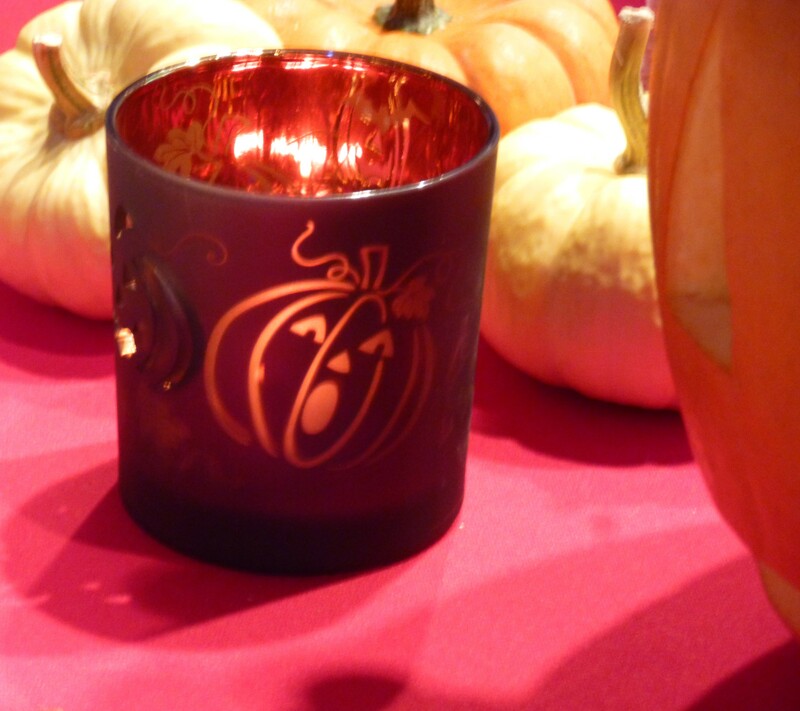 Check Out That Stylish, Grape Cluster Wig on the Pumpkin! When I was a kid growing up in California, I recall an animated TV commercial from the California Grape Growers featuring just a bunch of grapes on screen and two people talking off-screen about how Grapes were so “Sweet and Juicy” that somebody should “package them and sell them for snacks,” adding that “Grapes” was also “a catchy name”! It was hilarious, but also made a lot of sense in that Grapes are a delicious natural snack that don’t need a lot of tarting up to make them appealing to consumers. 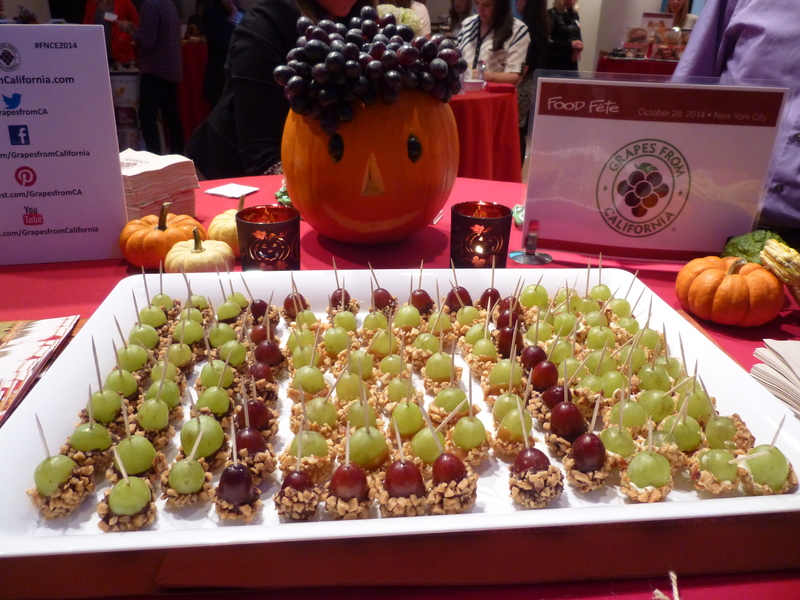 At Food Fête, Grapes from California offered a delicious and easy to make Grapes treat called Tuxedo Bites, which are just fresh red or green grapes dipped in melted milk, dark or white chocolate, or melted caramel, and dipped in nuts or crushed candy. So easy to make for your holiday party! Get more great grape recipes at This Link! Continuing along in a nostalgic vein, another item I remember from childhood is Aardvark Paper Straws, which are making big comeback, and it’s about time. 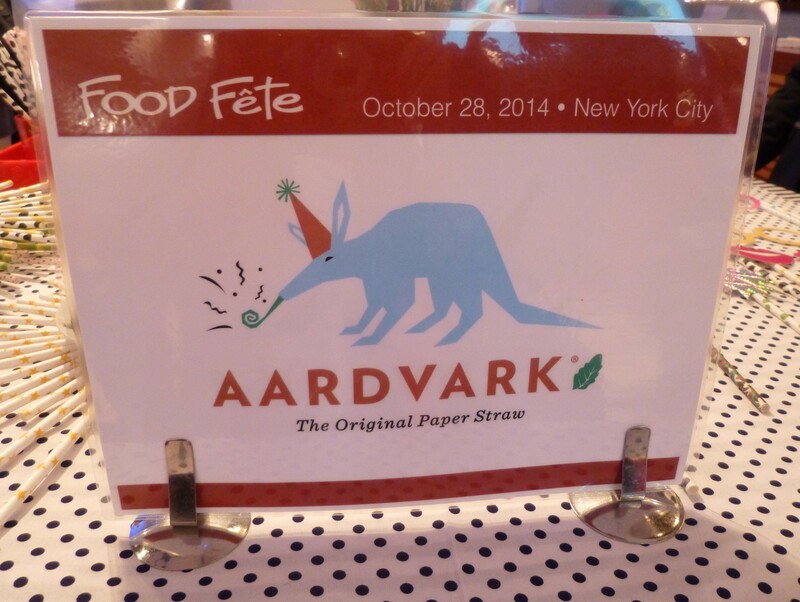 Aardvark, the original paper drinking straw, reentered the market in 2007, primarily in response to the growing anti-plastic movement. 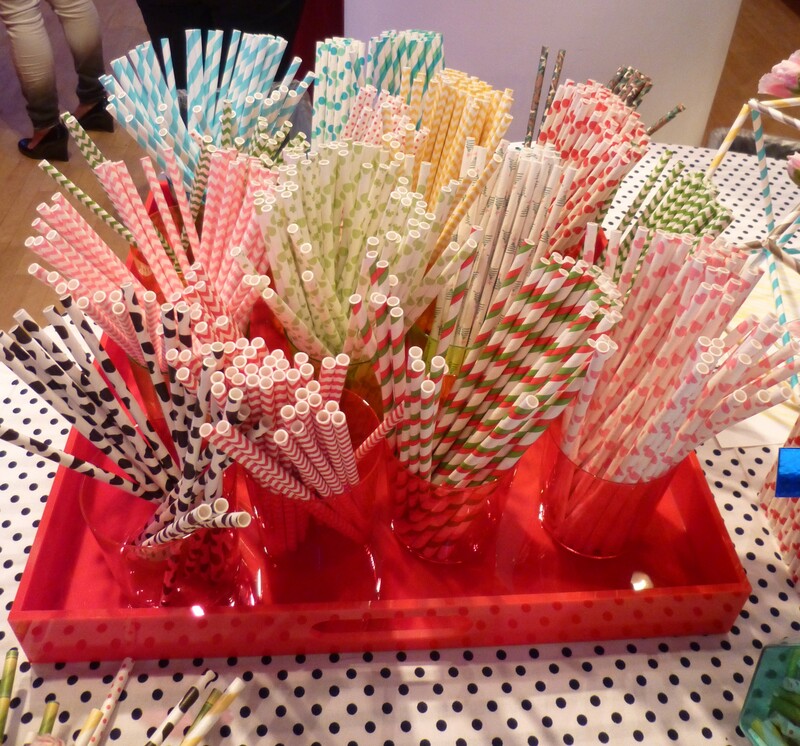 Now manufactured by PPG, these colorful straws are more durable and more sustainable than any paper straw on the market. Aardvark Paper Straws are 100% biodegradable, so their use can help reduce the plastic in our landfills and waterways – good for the planet and everyone who lives on it! They are also fun for parties and can be inspiring in the creation of all kinds of fun crafts for kids! 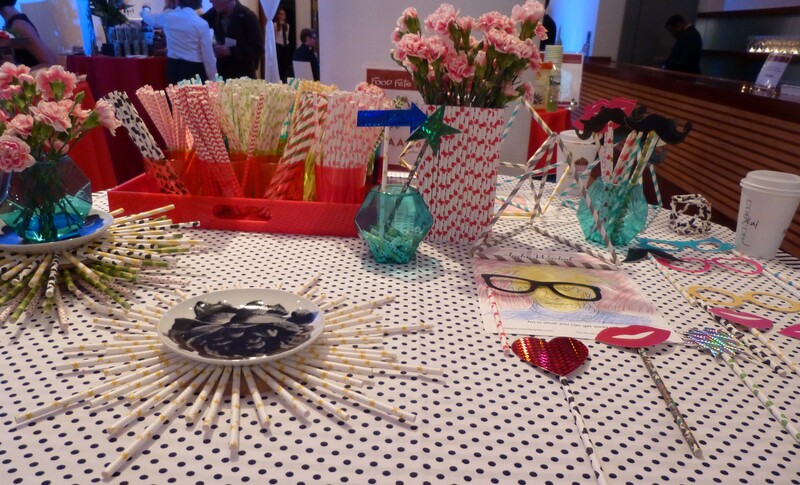 Find out more about Aardvark Paper Straws by visiting them online at This Link! Hey, do you like Coffee? Who doesn’t! 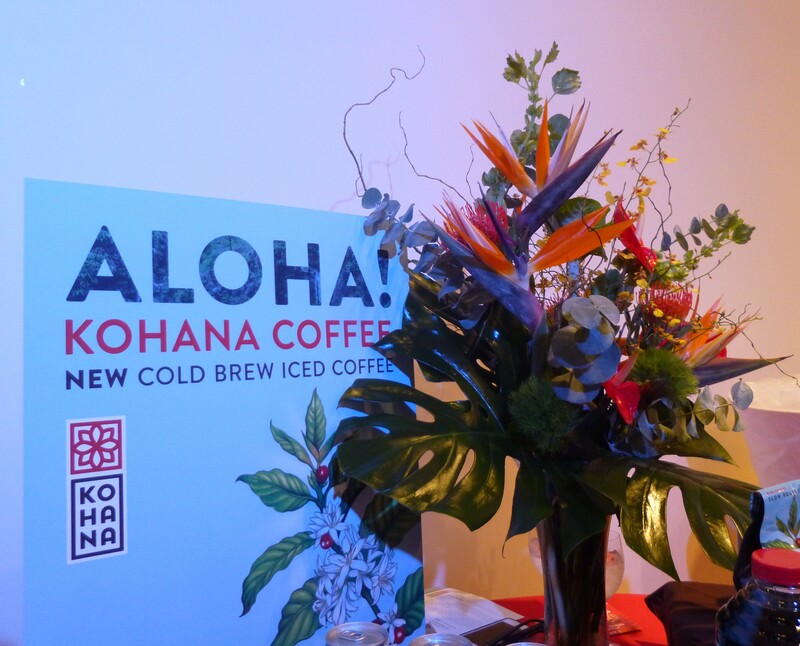 New coffee products are always so exciting, and Kohana ready-to-drink, cold brew ice coffee is a delicious new drink that will attract your attention with a gentle “Aloha”! Organic, low in acid, and lightly sweetened with all natural monk fruit extract, Kohana cold brew ice coffee is available now in 8-ounce, shelf-stable cans that have a 9 month refrigerated shelf life! Flavors include class Black, White (with Milk), Salted Caramel, and Vanilla. 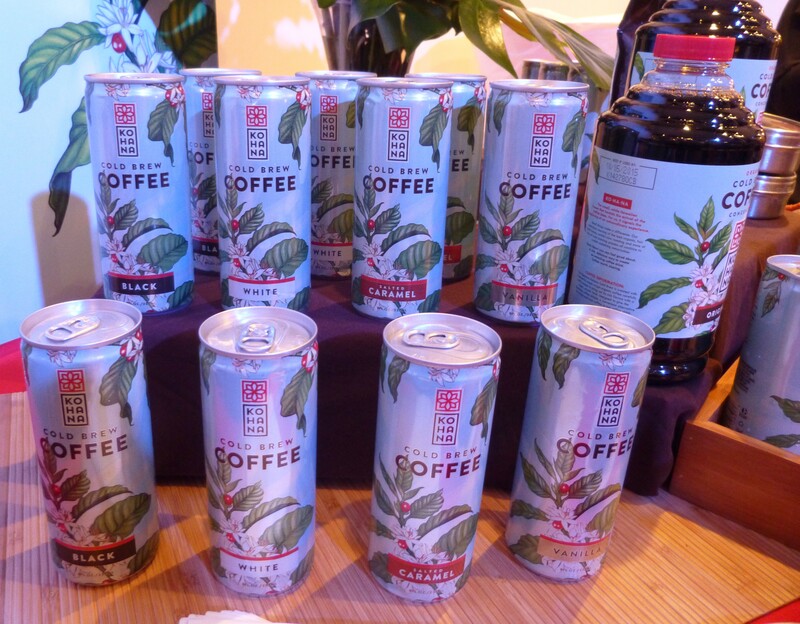 Find out more about Kohana Cold Brew ice coffee in a can at Kohana Coffee Dot Com. NatureBox Snacks is an idea you should put on your Holiday Gift Giving list for anyone who loves receiving delicious and wholesome snacks delivered directly to their door! NatureBox is a snacker’s dream come true, in that they offer highly customizable subscriptions to receive boxes of packaged healthy, natural and – most importantly – insanely delicious snacks each month! You can design your NatureBox subscription to receive as few as five or as many as twenty bags of tasty snacks shipped right to your home. 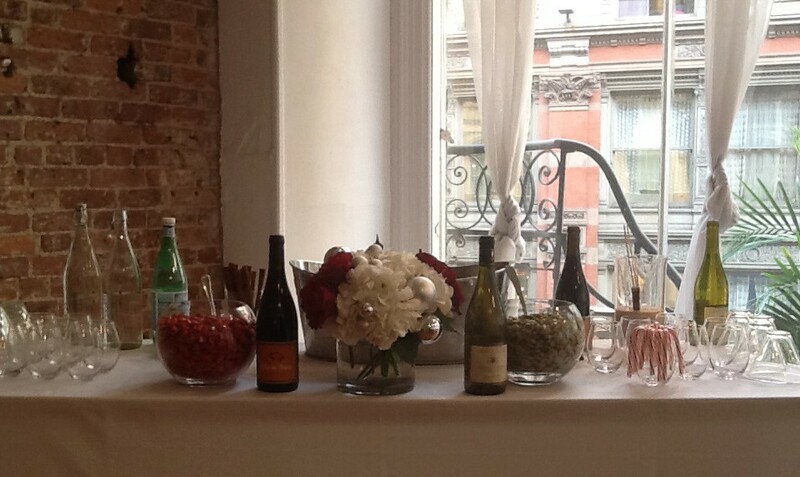 Likewise, you can also select whether you’d prefer to choose the snacks you will receive or be surprised. 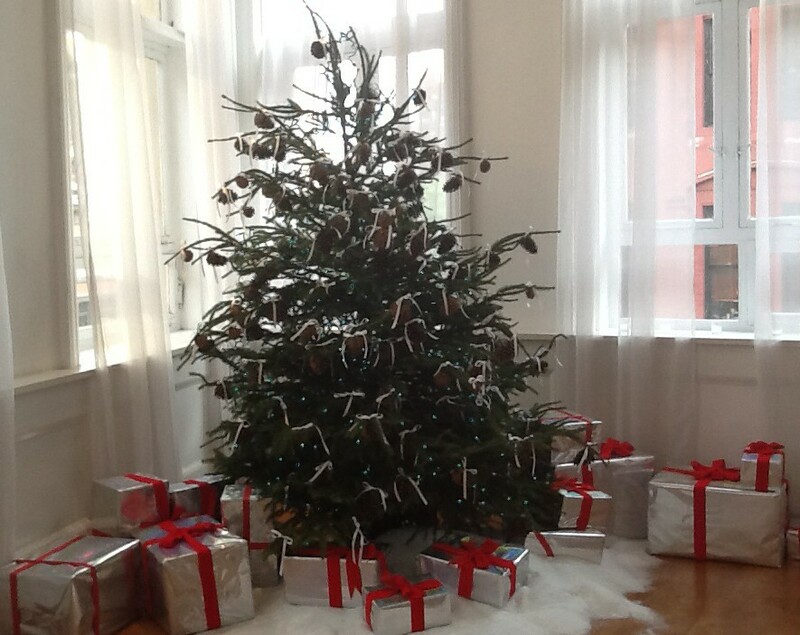 Personally, I like surprises, because it is like Christmas. Christmas! Give a nature Box gift subscription – or start one for yourself – right now by visiting Nature Box Dot Com! NatureBox Dark Cocoa Nom Noms. Yummy! 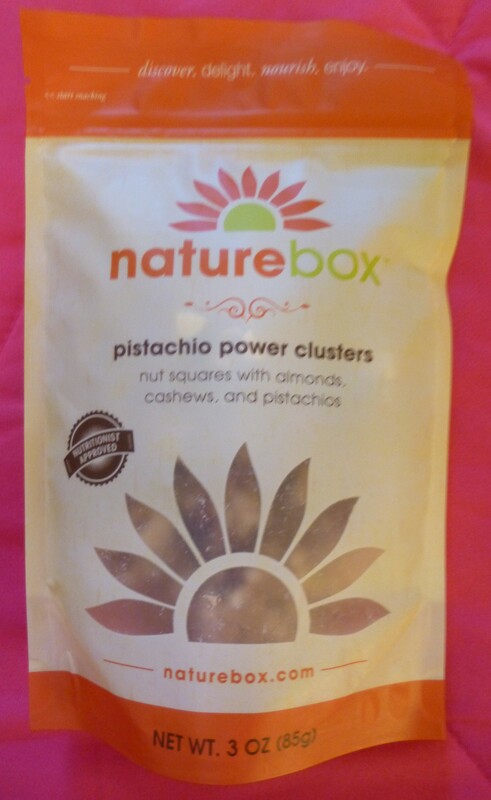 Favorite NatureBox Snack: Pistachio Power Clusters! 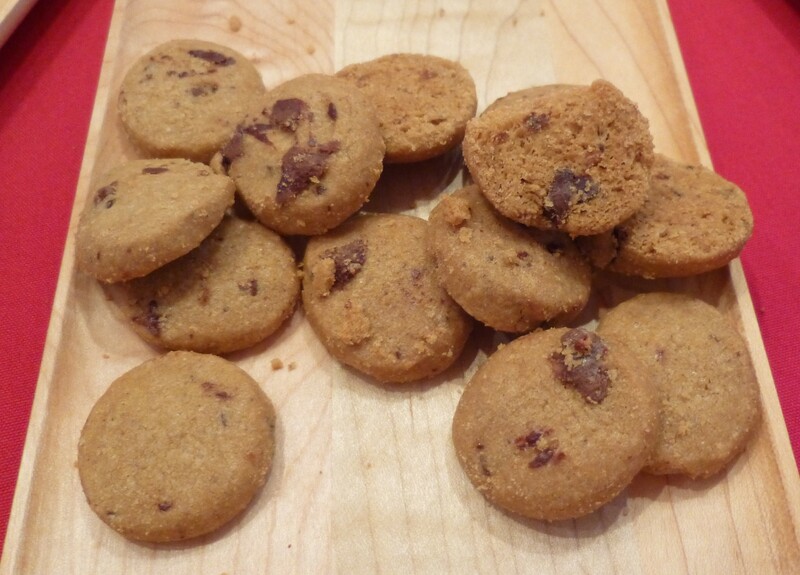 Ginnybakes is a line of outrageously delicious and nutritious organic, gluten free and non-GMO Cookies, Bars and Baking Mixes that is family owned since 2010. 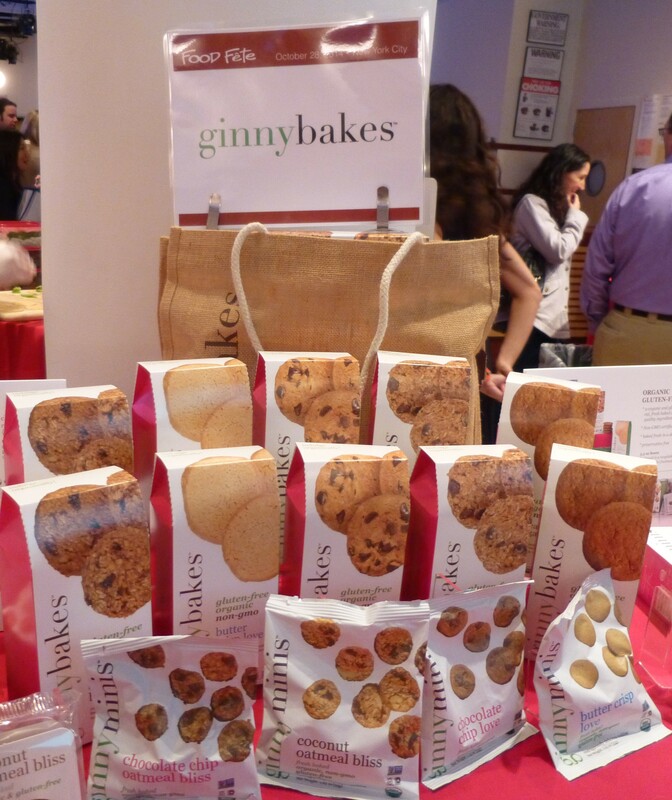 At Food Fête we had the chance to sample a variety of their cookies and Ginnyminis — 6-count bags of Ginny’s best-selling cookie flavors that are perfect for snacking or to toss into a lunch box. We also love their slogan: “Indulge Mindfully!” Find or more about Ginnybakes’ line of tempting baked goods that are good for you at This Link. 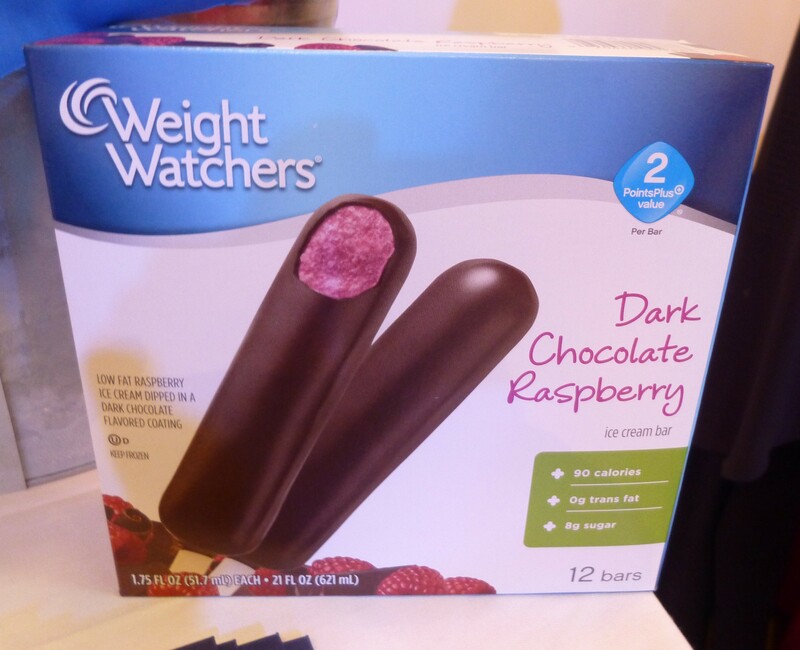 One indulgent dessert that is going to be convenient, delicious and guilt-free are selections from Weight Watchers line of frozen bars. Dark Chocolate Raspberry Ice Cream Bars feature a rich, dark chocolate coating on the outside and cool, low fat raspberry ice cream on the inside. It’s all the sweetness you crave with just 90 calories and 0 grams trans fat per bar. 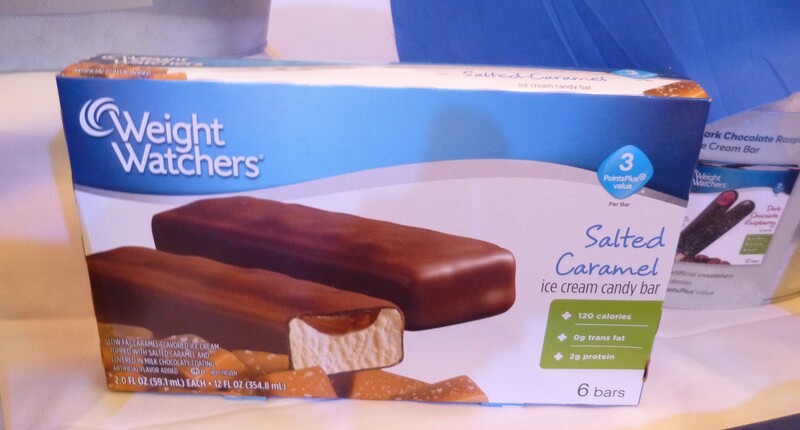 Also brand new are Weight Watchers Salted Caramel Ice Cream Candy Bars — perfectly cravable for lovers of the continually trending sweet and salty taste of low fat caramel ice cream topped with salted caramel covered and in a milk chocolaty coating. You would never believe these decadent bars are only 120 calories, 6 grams of fat and 0 grams trans fat each! Find out where you can buy these bars and other fine Weight Watchers products at This Link! One stand out new product we were introduced to at Foot Fête is Little Miracles, a UK-based Tea and Super-Juice Blend that tastes fantastic! Organic and sweetened only with natural agave, these healthy beverages come in four unique tea/juice blend varieties but our favorite was the White Tea & Cherry (with ginseng and acai berry) which, seriously tasted like Christmas. And that does not mean it tasted like a pine tree but, rather, that its delicious and honestly refreshing flavors were experienced as pure joy in the mouth. 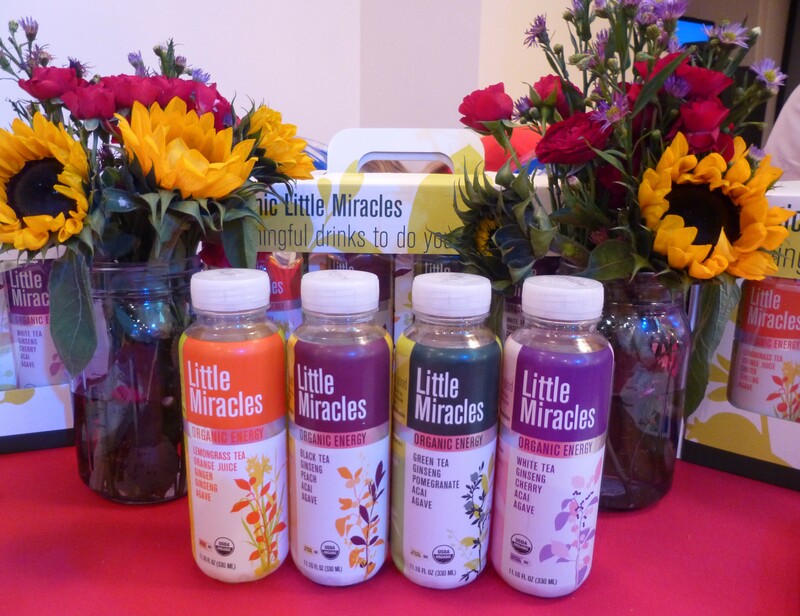 Find out more about Little Miracles by heading over to Drink Little Miracles Dot Com. 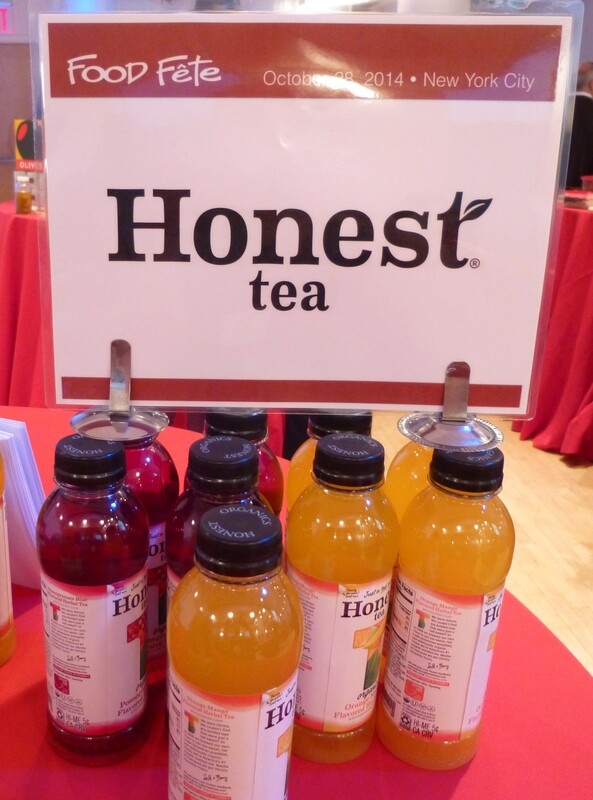 And while we’re on the subject of Flavored Tea Drinks let’s give shout out to one of our favorite brands, Honest Tea, who introduced two new flavors at the show. Orange Mango flavored Herbal Tea is made with organic grape, orange, lemon and mango with notes of lemon balm. Pomegranate Blue flavored Herbal Tea contains the flavors of organic pomegranate, grape and blueberry, infused with organic hibiscus. Both varieties are just 100 calories per bottle! These new flavors will be in stores starting January 2015! 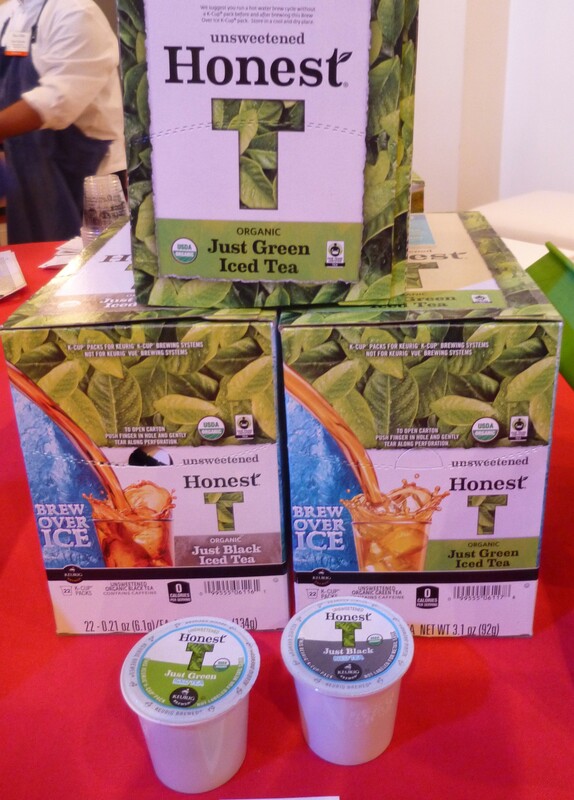 For Keurig users, Honest Tea also introduces both Green and Black Tea K-Cups so that you can brew fresh, unsweetened iced tea one cup at a time! Just brew hot tea over a cup of ice! Honest Tea K-Cup packs are available now. Get more information about Honest Tea at Honest Tea Dot Com. If you watch the fantastic TV show Last Week Tonight with John Oliver, then you probably recall a recent rant that John went on where he described Cranberries as being like “Cherries that hate you.” Despite the great belly laugh inspired by that line, we do not agree! 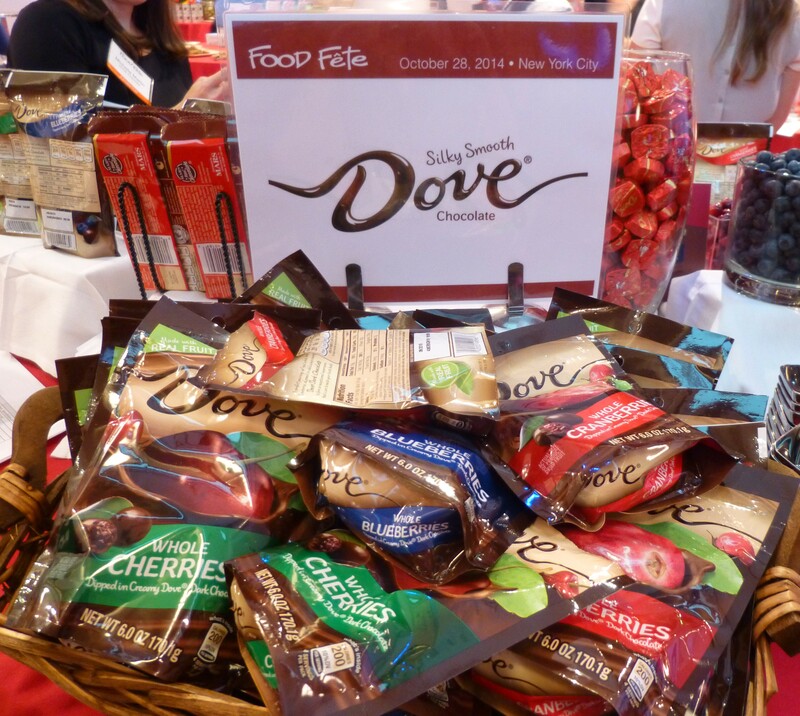 Dove brand — famous for their fine chocolate and chocolate-dipped ice cream bars — are now bringing their way with chocolate to the popular venue that is whole fruit dipped in dark chocolate – sweet, delicious Cranberries included! 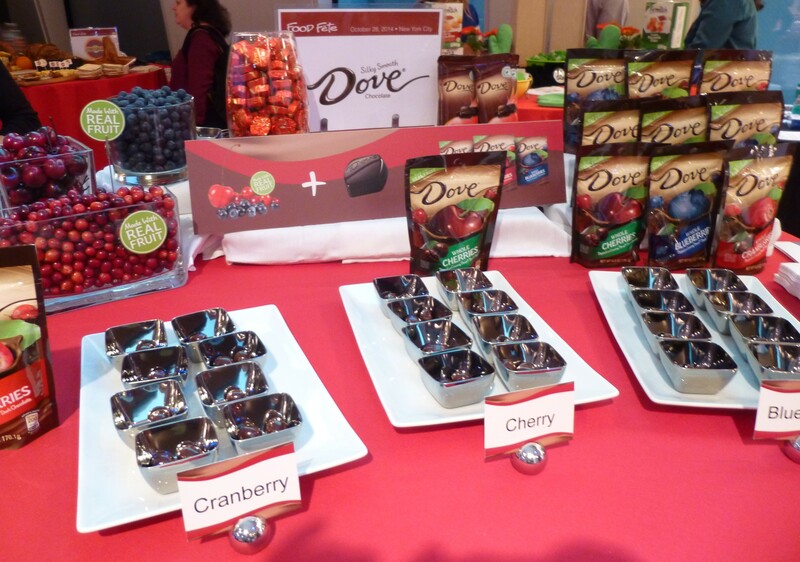 Dove Whole Fruit Dipped In Dark Chocolate combines real whole berries dipped in smooth Dove dark chocolate in cranberry, cherry and blueberry varieties — which are the top selling fruits in the market. , Six-ounce standup bags of the Cranberry and Blueberry varieties were introduced in September, with a SRP range of $3.59 to $4.79. The six-ounce Cherry variety will debut in January, 2015 along with 2.83-ounce standup bags of Cranberry and Blueberry with a SRP range of $1.99 to $2.59, so get ready to stock up for the holidays! Find out more about the Dove brand at This Link! 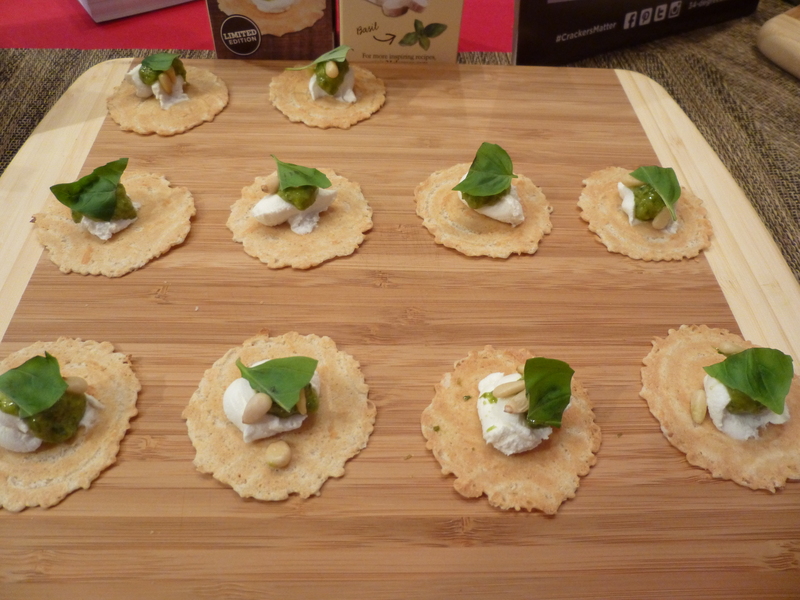 Last time we saw 34 Degrees Crisps at a Food Fête they were showcasing their sweet Chocolate Crisps — which are simply divine! New for fall are two savory flavors, Poppy Seed and Tasted Onion, both of which will be available for limited time only. Versatile Poppy Seed goes sweet or savory; from creamy cheeses and fresh fruit to cured meats and veggies. Bold Toasted Onion plays well with big flavors. Think tapenade, smoked meat or aged cheese. 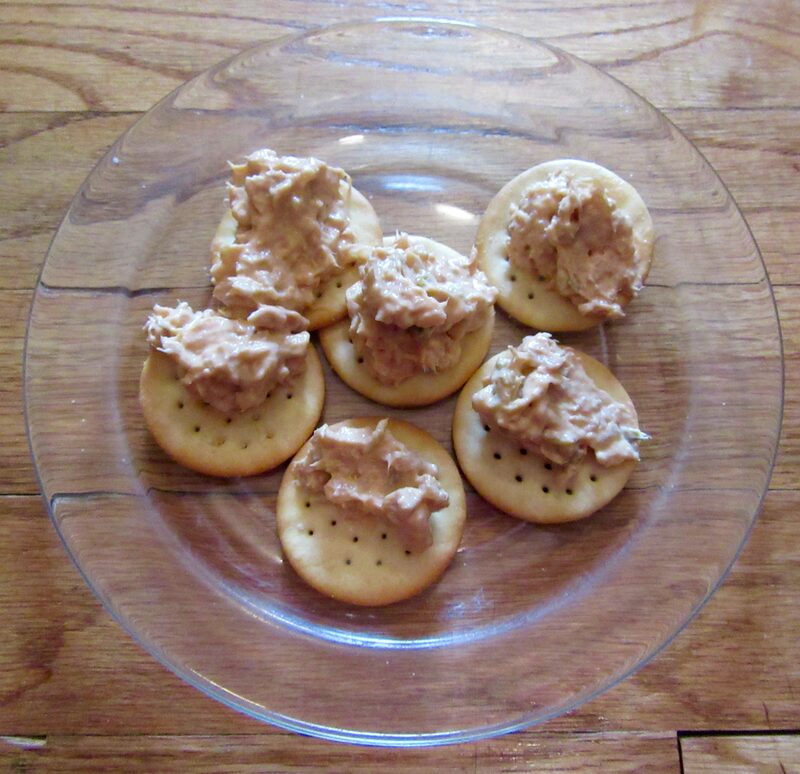 The lightness and highly appealing crispness of these crackers is unequaled and simply must be tasted to be believed. Look how gorgeous they are! Check out 34 Degrees products online at 34 Degrees Dot Com. Hot snacks from the oven are a perennial favorite for all home entertaining, and Farm Rich brand frozen snacks were on hand to debut their newest offering, Pepperoni Bites! These hearty snacks have a yummy pizza taste and are made with real mozzarella cheese that maintains an authentic “pull” when hot and melty. Find out more about the Farm Rich brand of convenience foods and get money-saving coupons at Farm Rich Dot Com. 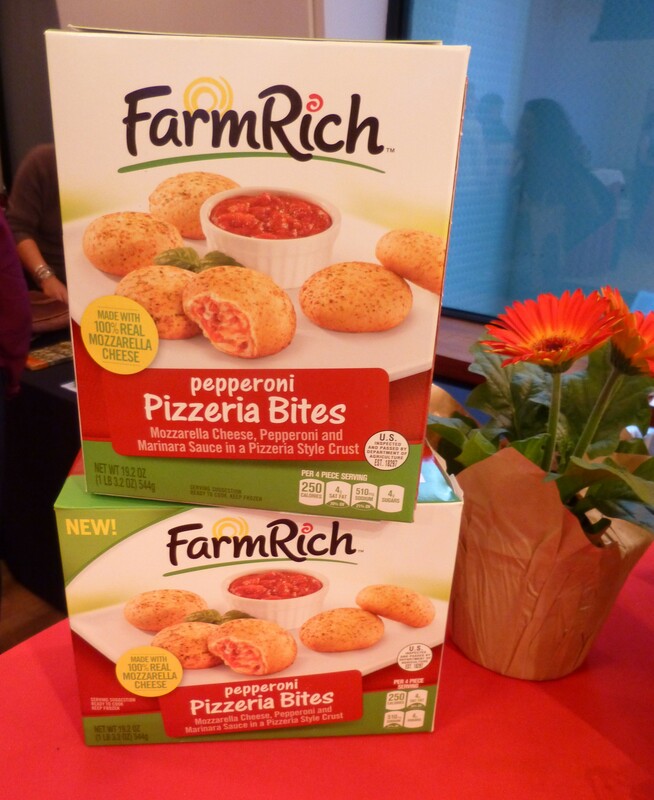 Farm Rich Favorite Mozzarella Sticks and New Pepperoni Bites Snacks! Cheese in every form is also a holiday favorite and Jarlsberg is global brand we’ve known and trusted all our lives, it seems. 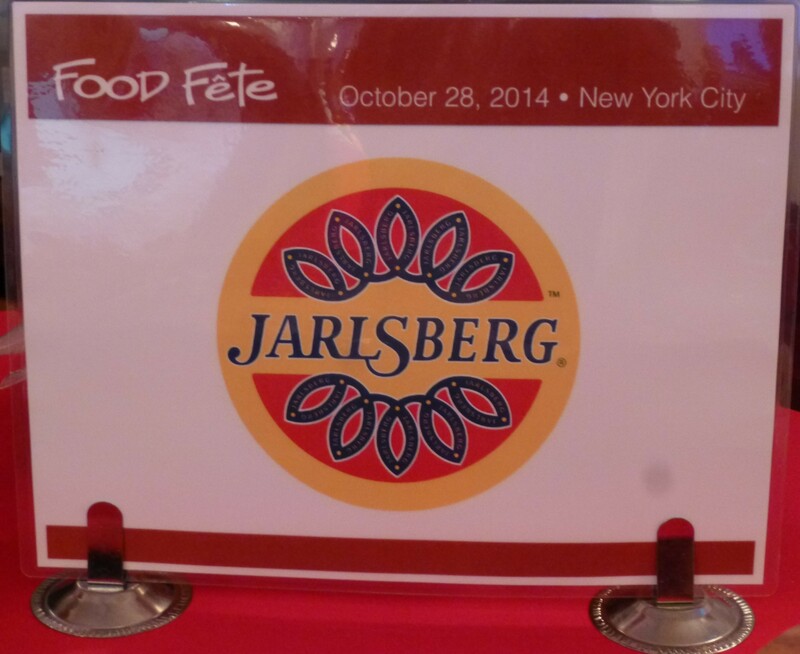 Get Jarlsberg product information and recipes at This Link. 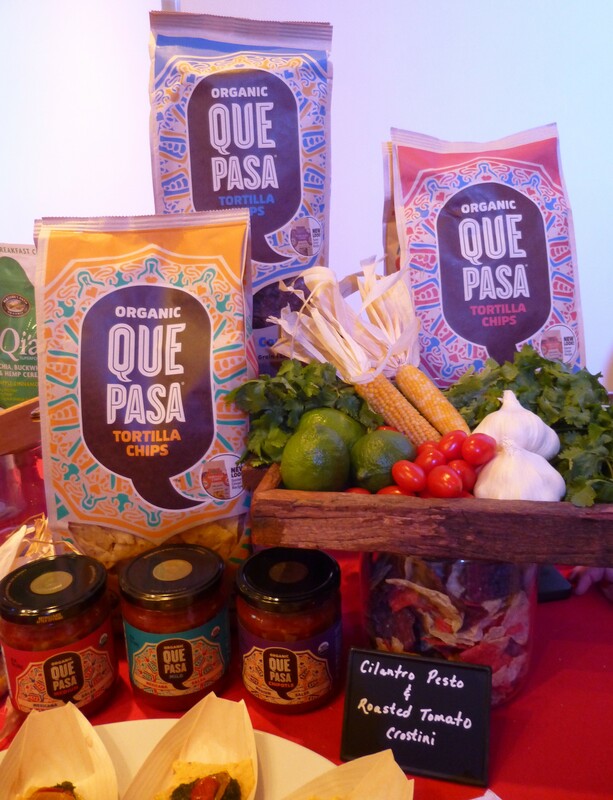 Que Pasa Tortilla Chips are an organic, Non-GMO and Gluten free snack that are as versatile as they are delicious! 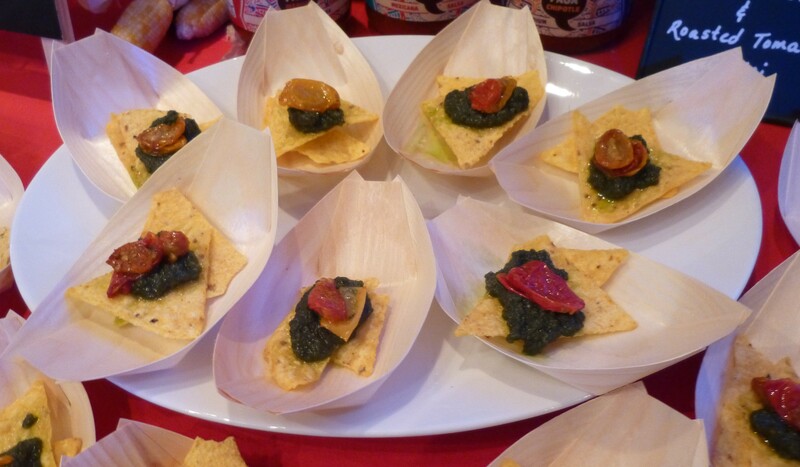 Find out how to make the above pictured Cilantro Pesto and Sundried Tomato Crostini (substituting Que Pasa Tortilla Chips for the tiny Crostini rounds) plus tons of other amazing dishes featuring with Que Pasa Chips and Salsas at at This Link! 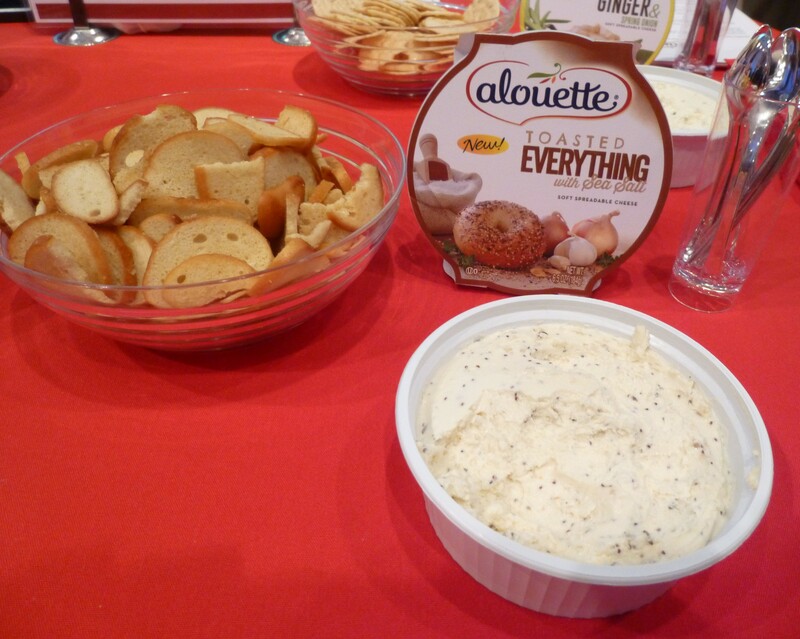 Alouette spreadable soft cheeses are a must-have on hand product for the holiday season and all year round. They are so versatile! New Flavors due in stores in February 2015 are Toasted Everything (perfect for your morning bagel!) and New York Cheddar. 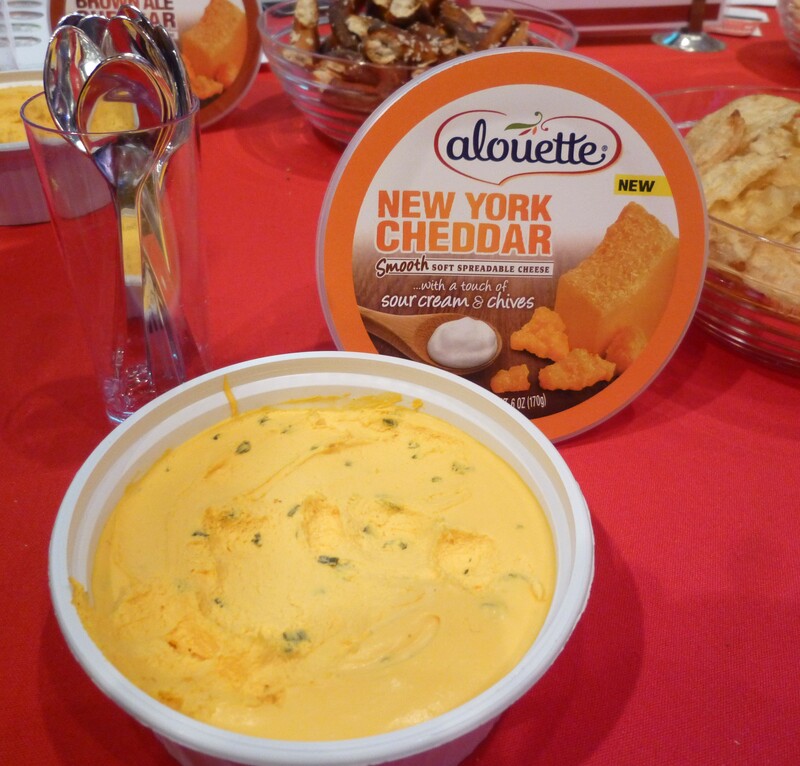 Get a printable coupon for $1.00 Off any Alouette Cheese Product by visiting This Link. 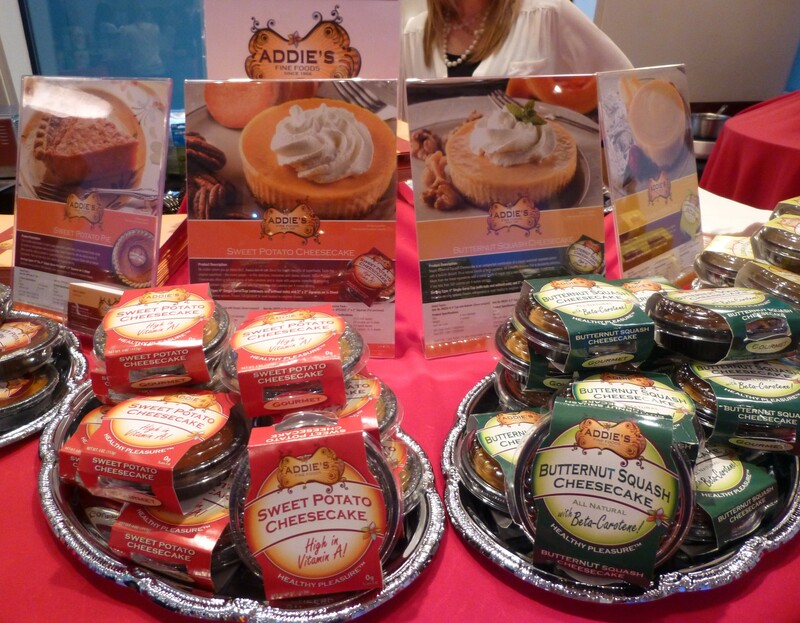 Here’s another new product that we went completely insane for: Addie’s Fine Foods miniature pies and cheesecakes! 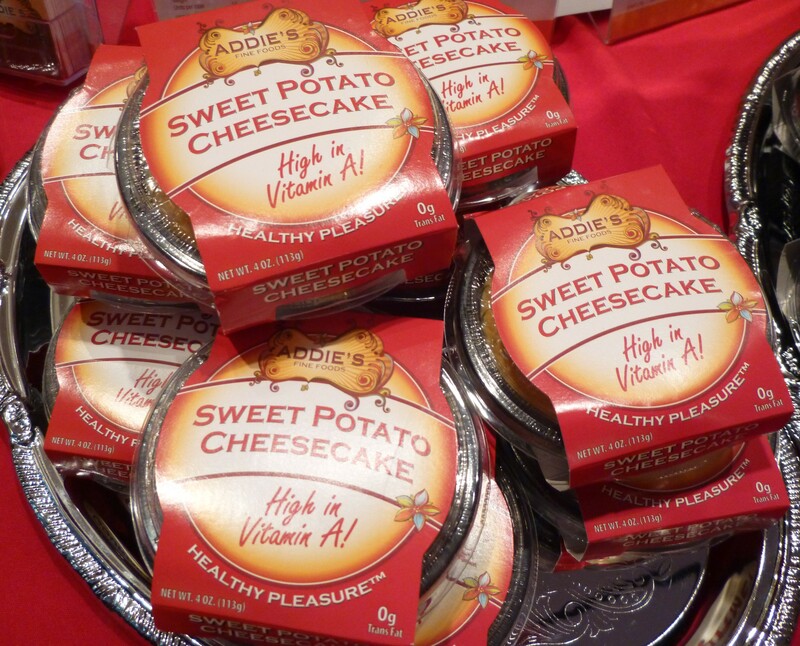 Made from the decades old, original recipes of Addie Simon, Addie’s sweet potato desserts (both pies and cheesecakes) are made with two varieties of sweet potatoes. The orange sweet potatoes are high in beta-carotene, while purple sweet potatoes are high in antioxidants, and both have proven healthful effects. Sweet potatoes are a substantial source of dietary fiber, which helps lower blood sugar by slowing the rate at which food is converted into glucose and absorbed into the bloodstream. You will be amazed that something so good for you can taste so decadently delicious. Addie has also created luscious Lemon Ice Box Pie and classic Butternut Squash Cheesecakes to the line of healthy pleasures. 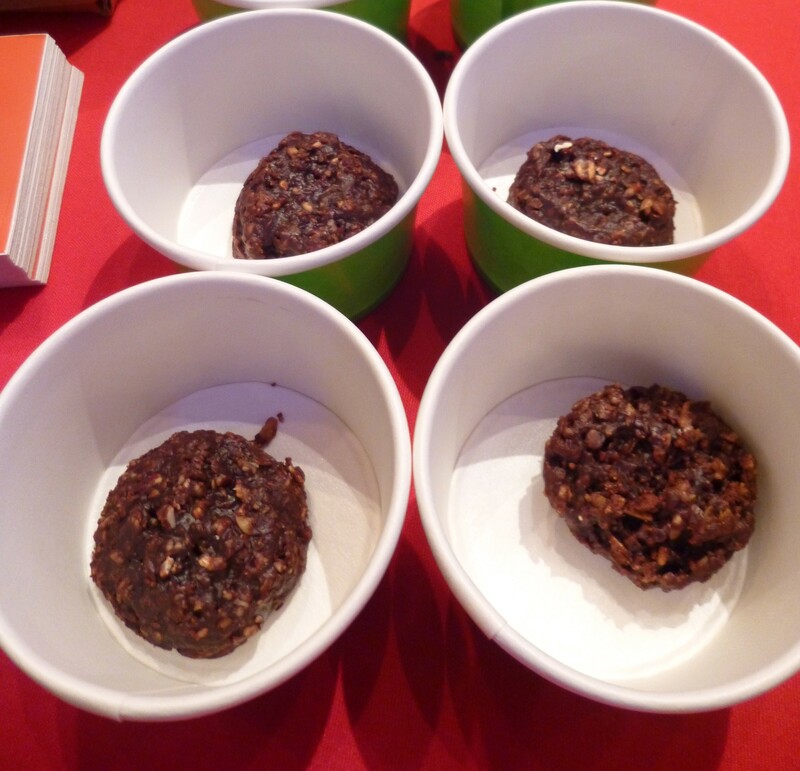 All of Addie’s desserts are made with less sugar and have fewer calories without sacrificing taste. Trust me, I sampled each of these deserts at Food Fête and simply could not shut up about how astoundingly delicious they were. 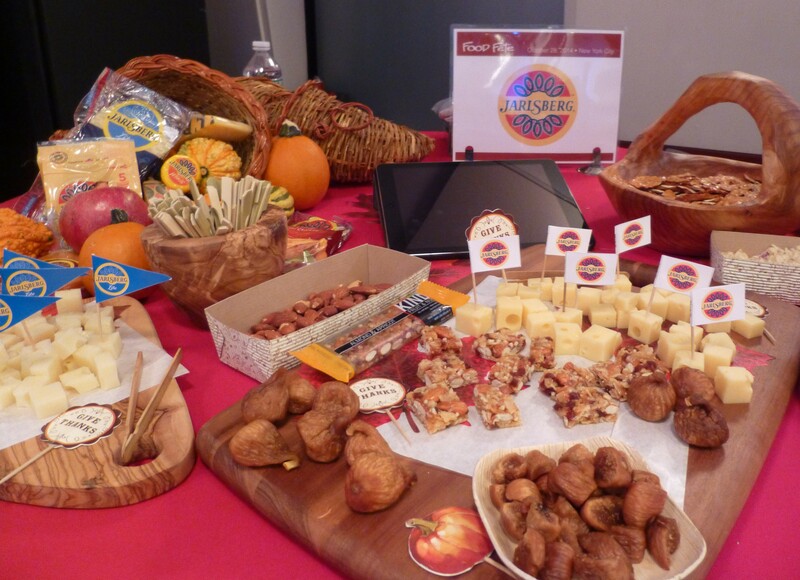 Find out more about Addie’s Fine Foods — our Number One find at this season’s Food Fête — at Addies Fine Foods Dot Com. 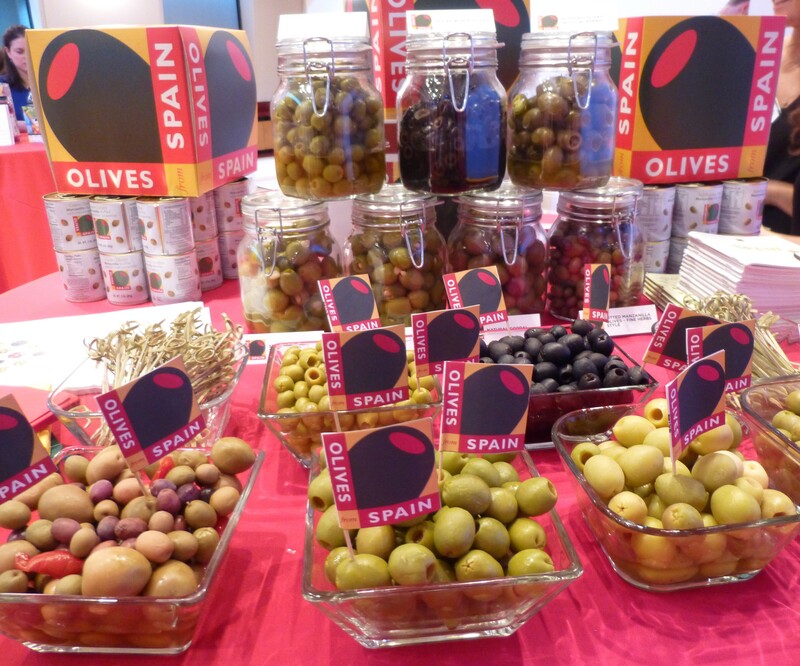 Olives From Spain were there to represent for a tiny fruit that not only tastes delicious on its own, but enhances the recipes of many different kinds of regional dishes. After sampling several luscious and flavorful Spanish Olive varieties (we still love Black Ripe Olives the best) we came back home with two cans of Olives and a gorgeous, full color mini Cook Book, which will give us a lots of ideas on creative ways to use them. Explore the world of Olives from Spain at Olives From Spain Dot US. Recently, we watched an episode of excellent the PBS series, Food Forward, on how many Ranchers are returning to traditional, grass-fed styles of raising cattle — which made a significant and permanent, thought-changing impact regarding the most sustainable and humane way to raise cattle for food. This is why we love Niman Ranch, a company that offers a complete line of fresh Beef, Pork, Lamb and Cage-free Eggs as well as a variety of smoked and prepared items. All Niman Ranch livestock are raised on hormone and antibiotic free, 100% vegetarian diets and are 100% traceable from farm to plate. It follows then that their products are All-natural, Gluten Free, Nitrite and Nitrate free and MSG Free. Most importantly, their meat products all taste delicious! 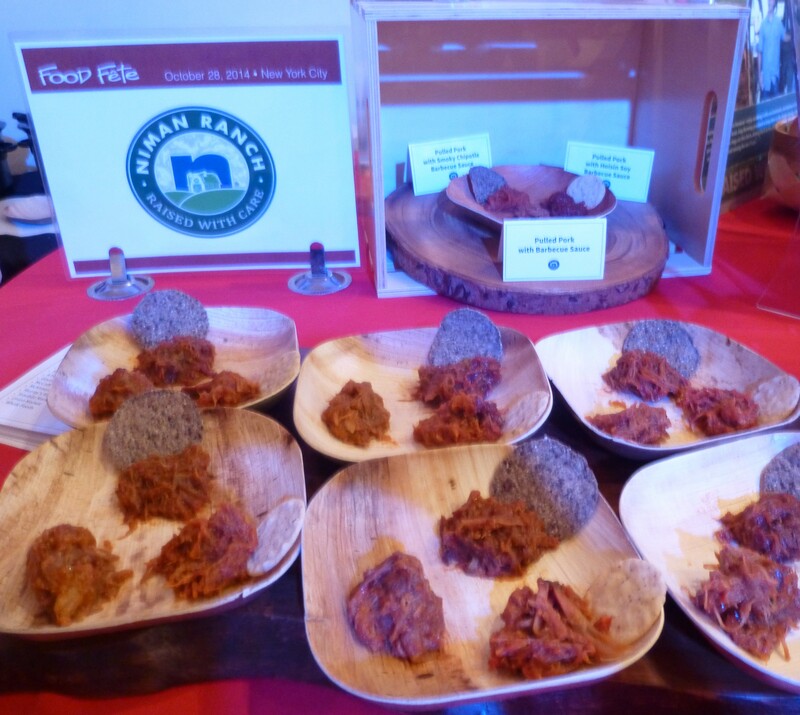 At Food Fête, attendees sampled three new prepared Pulled Pork vairietes in different BBQ sauces — Regular Sweet Sauce (not to spicy), Smokey Chipotle, and Hoisin Soy BBQ Sauce. The pieces of pork were large, the meat was tender, and the flavor was delicious. 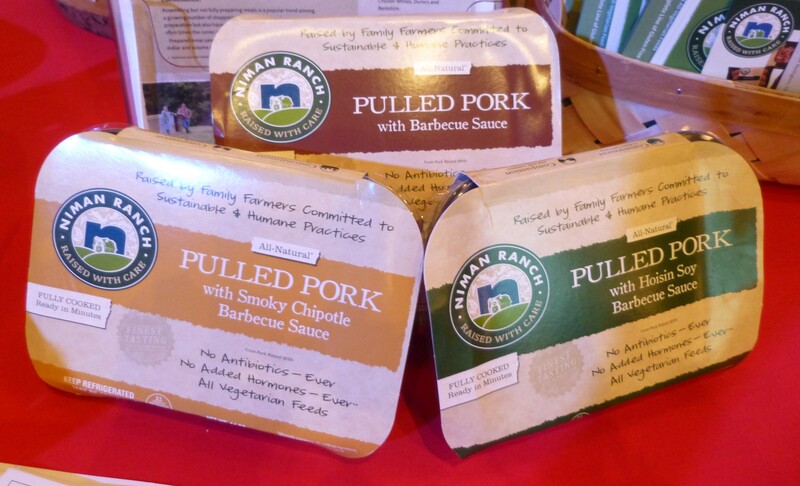 All you have to do is heat and serve for easy pulled pork sandwiches! 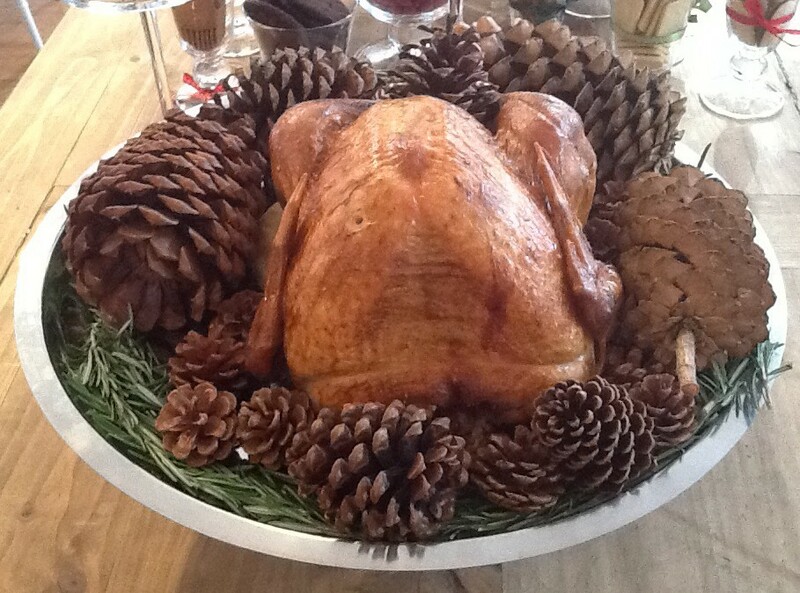 Find out more about Niman Ranch meats, get recipes and shop online at Niman Ranch Dot Com. And that’s it for this edition of Food Fête! Thanks as always to Jeff Davis for producing another great show! See you in the Winter! 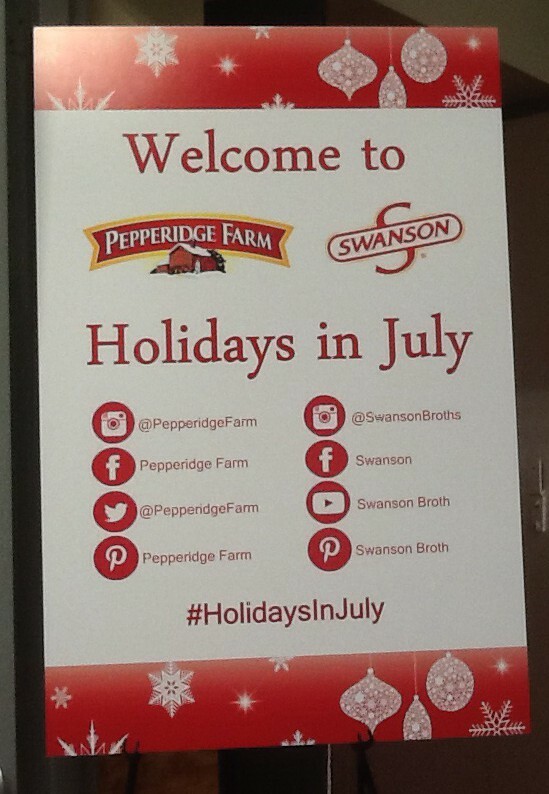 Pepperidge Farm and Swanson Present Holidays in July! The idea of Christmas in July has always been exciting to me, because I love the Holiday season, but I also love Summer. So it was extremely fun to be invited to a lovely Holiday-Themed Dinner Party thrown by Swanson and Pepperidge Farm that not only featured delicious foods but also easy cooking tips and beautiful home decorating ideas. Win win win! Of course, the point of the Holidays in July Campaign is not rush the coming of the season but to point out that it is never too early to start planning! 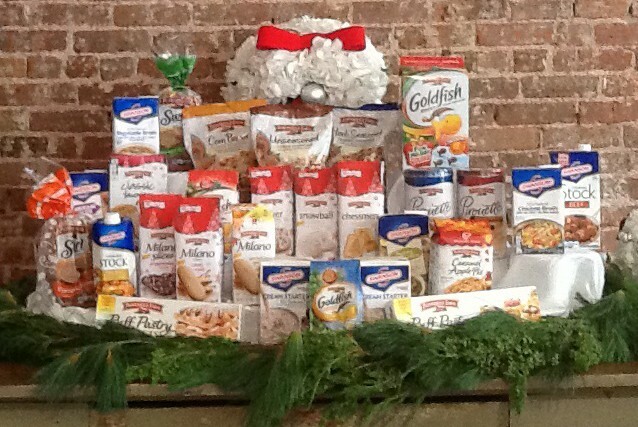 Swanson and Pepperidge Farm (which are both owned by Campbell Soup Company, a fact I did not previously know) had the event space decorated beautifully complete with seasonally appropriate touches including a Tree, Wreaths and Wrapped Presents — very festive! 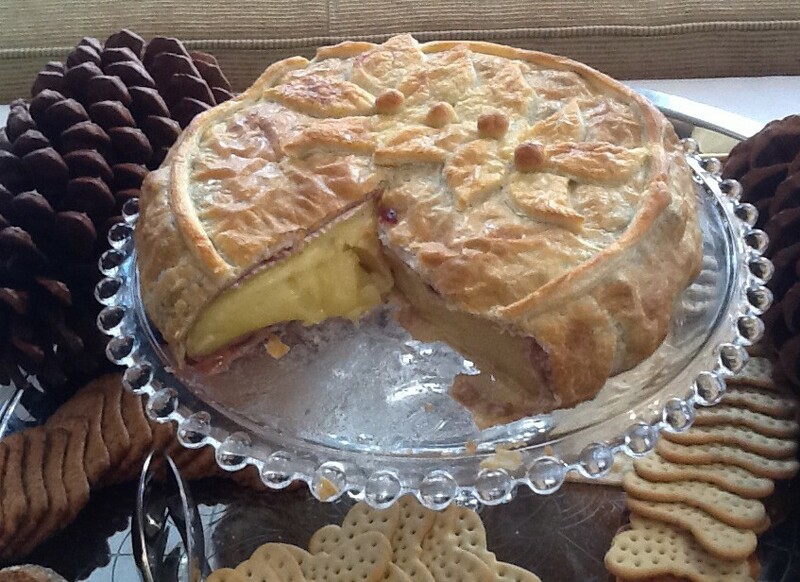 Before dinner was served, we all enjoyed a spread of delicious snacks, including this insane Brie En Croute made with Pepperidge Farm Puff Pastry. Look at this gorgeous thing. Just look at it. 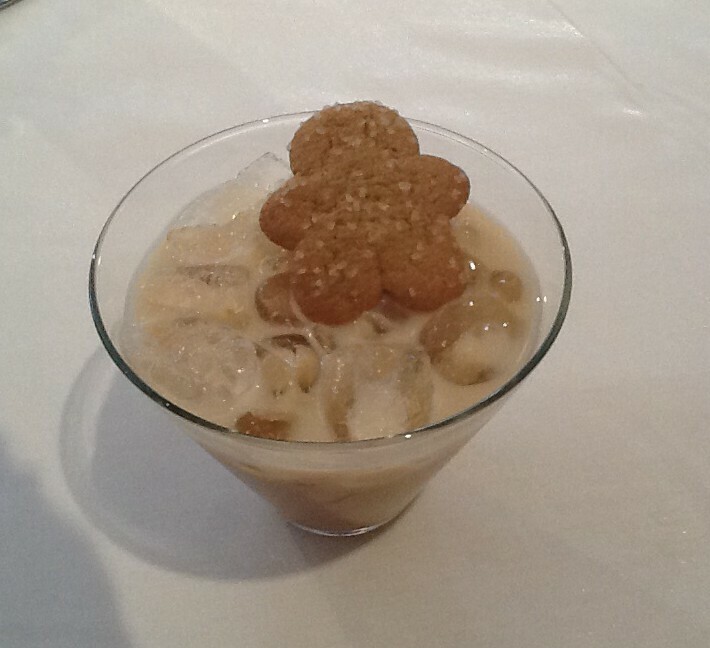 Pre-dinner cocktails included a signature drink, the Gingerbread Martini, topped with a Pepperidge Farm Gingerman Cookie! You would not believe how delicious and refreshing this cocktail was. 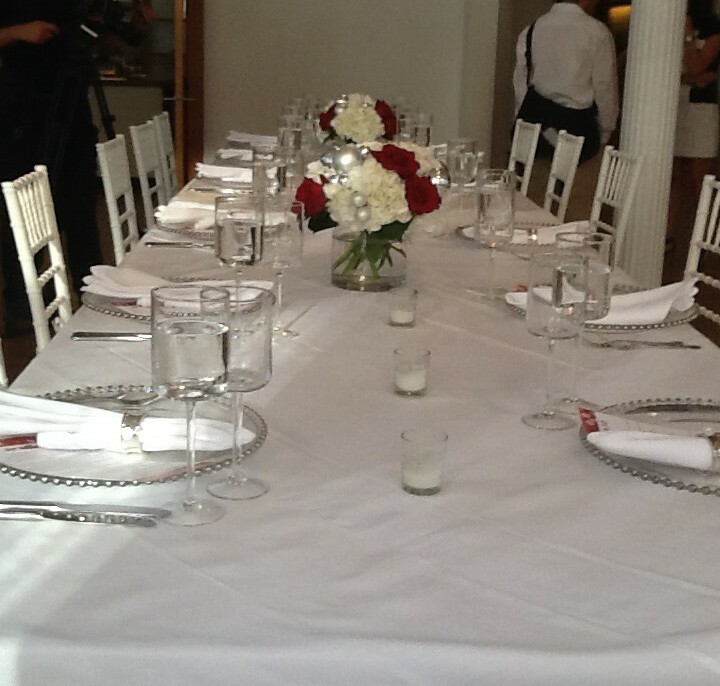 Nothing gets your guests excited for a delicious holiday meal quite like a beautifully set table. 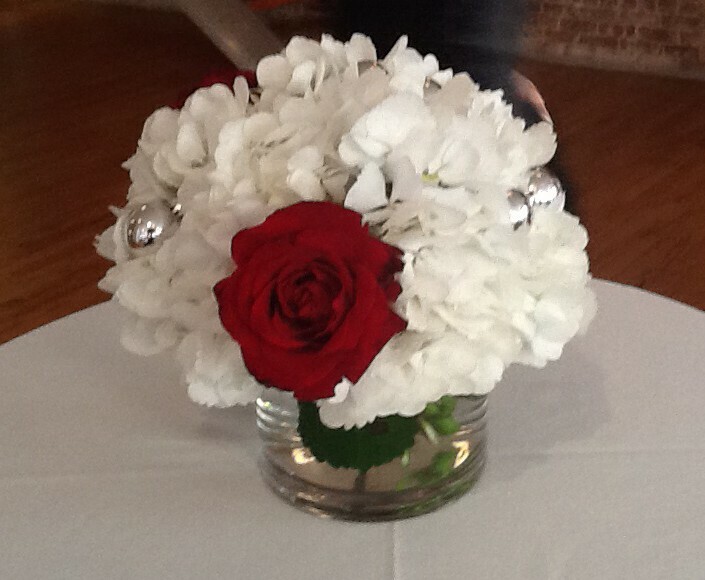 Mixing Christmas ornaments in with fresh flower arrangements really brings the seasonal atmosphere into your home. 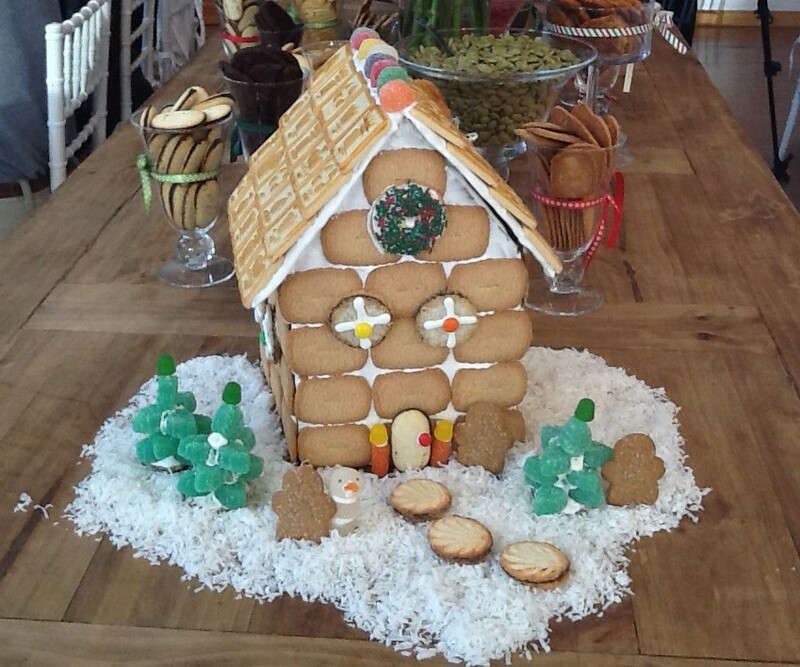 And look, somebody made a Gingerbread Cookie House from a variety of Pepperidge Farm Cookies! Herb Roasted Turkey and Pan Gravy with Swanson Chicken Stock. 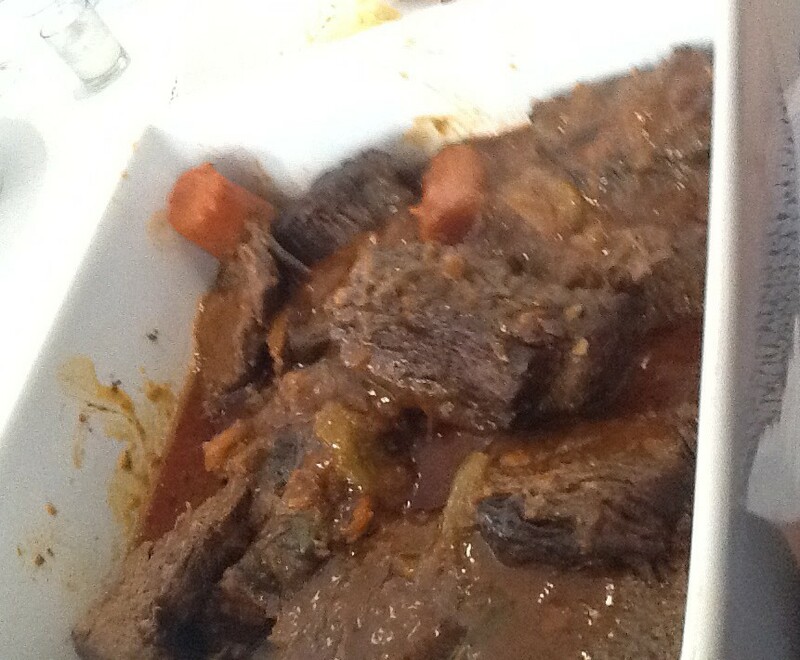 Red Wine Braised Short Ribs with Swanson Beef Stock. 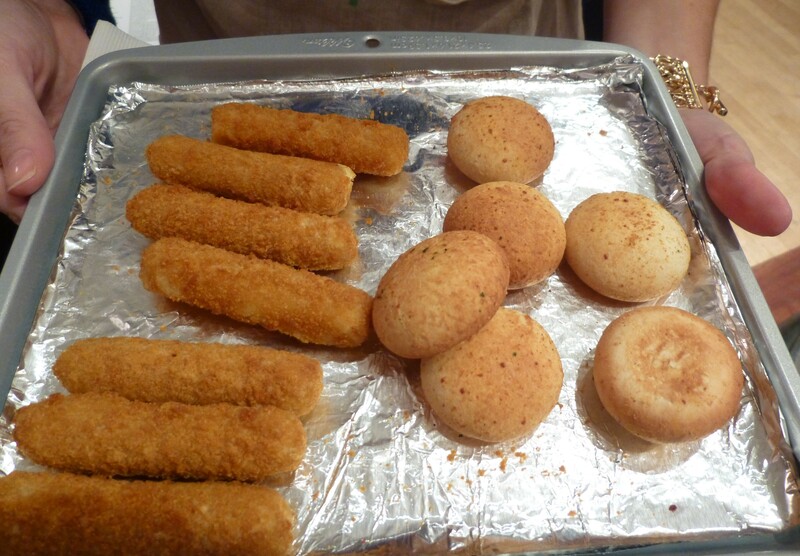 Here’s a fun presentation suggestion: serve two different kinds of potatoes side by side in the same dish! 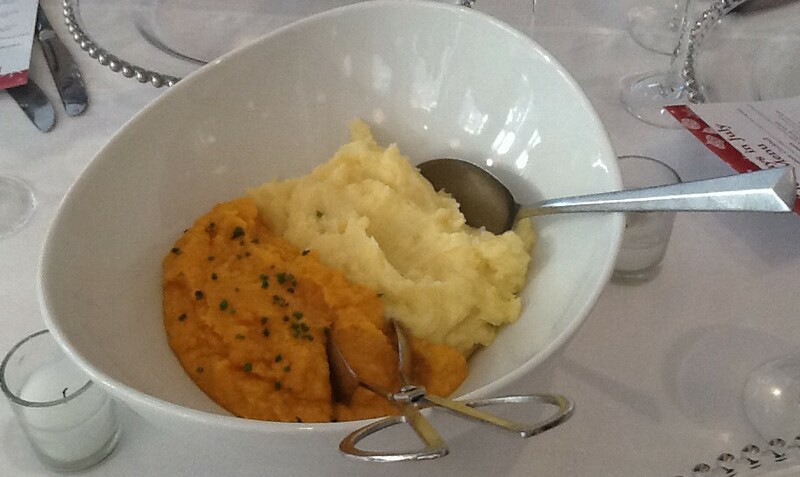 Above, you’ll see a Sweet Potato and Parsnip Puree nestled alongside ultra creamy traditional Mashed Potatoes. All vegetables were cooked in Swanson Chicken Broth instead of water, which simply enhances the flavor of the food without imparting a chicken taste to the finished dish. This is a tip I am definitely going to put into practice, because the results are outstanding. Check out this rich Four Cheese Macaroni and Cheese topped with crushed Pepperidge Farm Goldfish Crackers. Kids (and Adults) will flip over this! Caramelized Onion with Pancetta and Rosemary Stuffing made with Pepperidge Farm Herb Seasoned Stuffing and Swanson Chicken Broth. 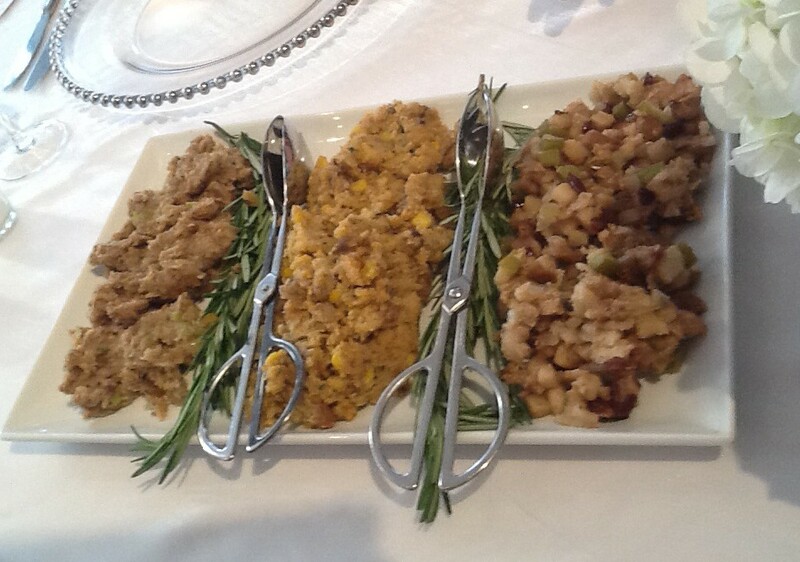 Sausage Cornbread Stuffing made with Pepperidge Farm Cornbread Stuffing. Baked Apple Cranberry Stuffing made with Pepperidge Farm Unseasoned Stuffing and Swanson Chicken Broth. (My Favorite). There was also an assortment of Pepperidge Farm Bake at Home Breads and Stone Baked Artisan Breads. After a huge feast like the one I’ve just talked about, everyone needed a bit of a rest before dessert. 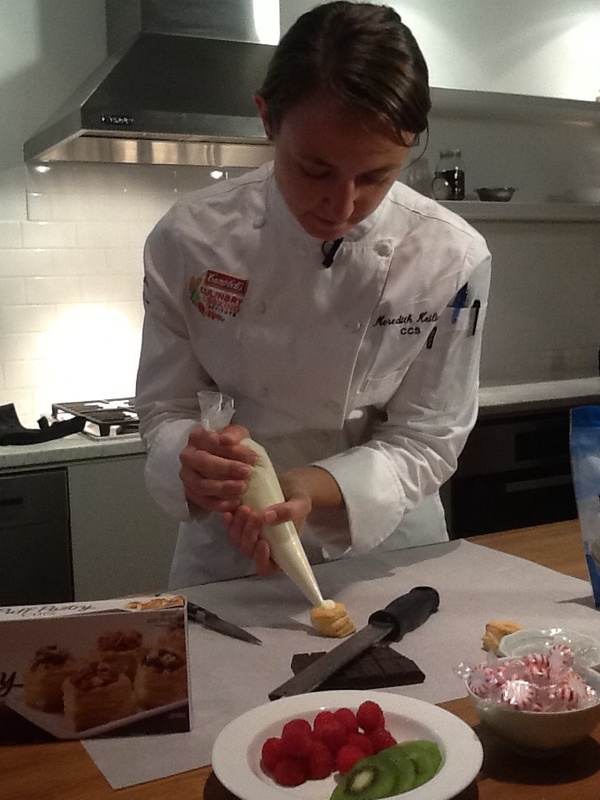 Everyone was invited into the kitchen to watch one of Pepperidge Farm’s in-house chefs demonstrate how easy it is to make desserts with the brand’s best-selling Puff Pastry! 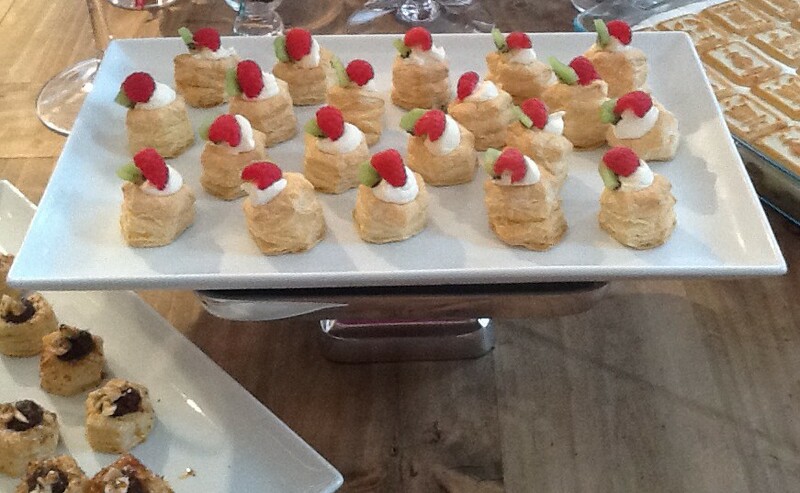 Puff Pastries topped with Fresh Fruit. 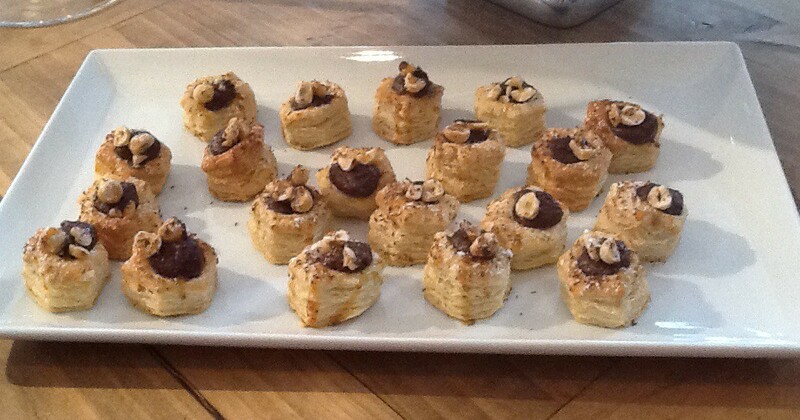 Puff Pastries filled with Nutella and topped with Hazelnuts. 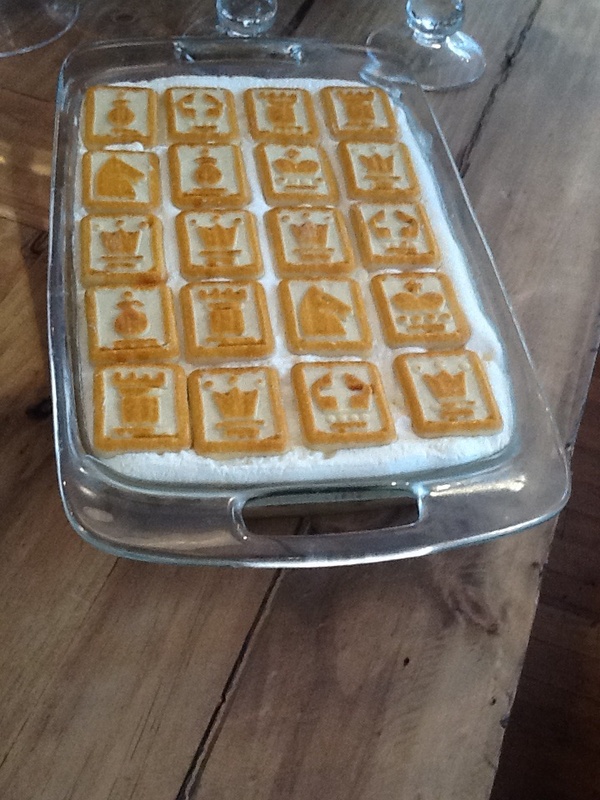 And last but not least, Bananas Foster Pudding topped with a layer of Pepperidge Farm Chessmen Cookies! Delish! 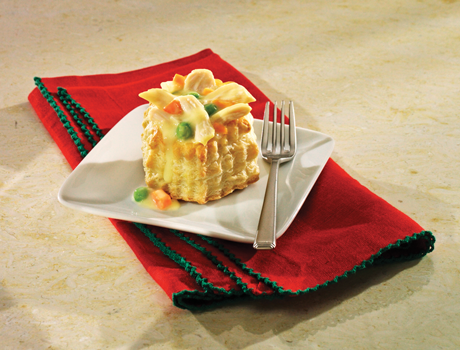 Get recipes mentioned in this post and more by downloading Pepperidge Farm’s Holiday Recipe Booklet at This Link! Happy Holidays! 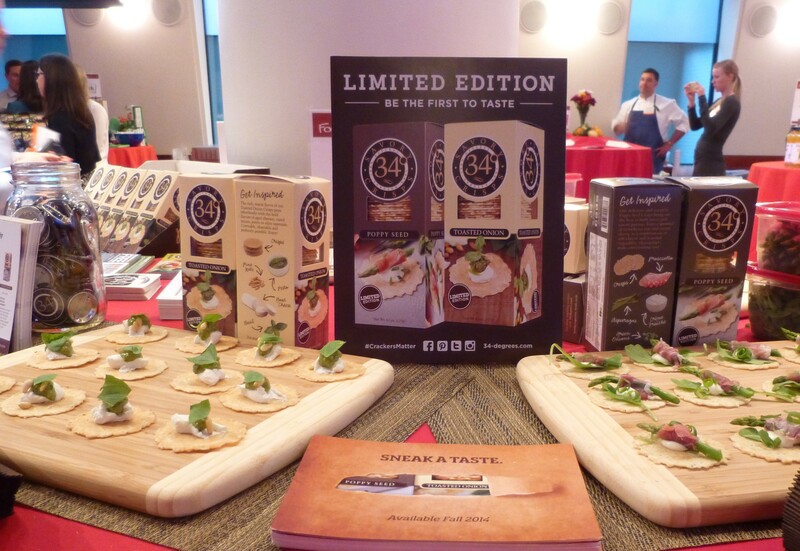 Scoozi Events Hosts a Chef Tasting in Midtown!